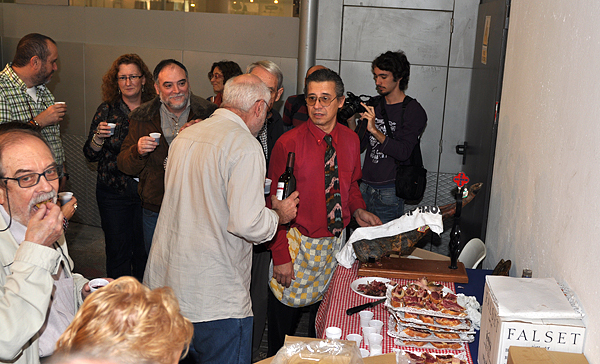 We also visited our friends from the Grup Mineralogic Catala who organized the party, of course the wine and pernil were present! 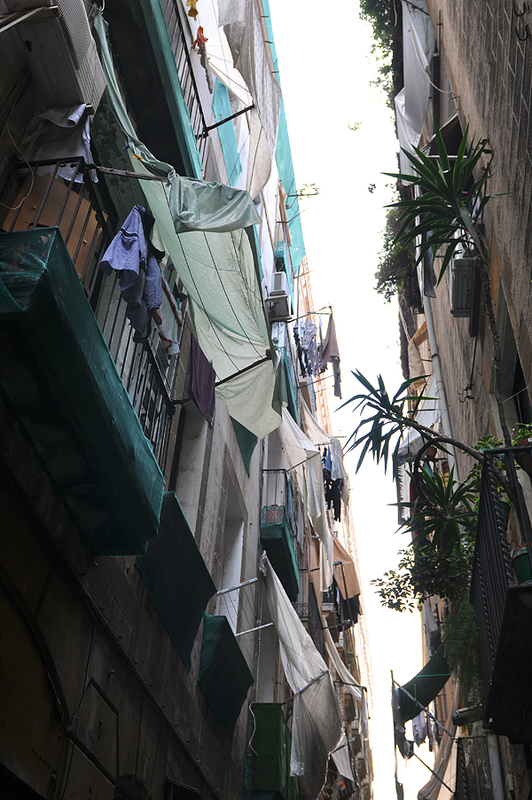 On Sunday I had to say good-bye to Asia and a few hours later I landed in Fez in Morocco. My plane was supposed to land at 1 A.M. but it was late and finally I arrived to my hotel in Midelt around 5 A.M.! Next day I was really tired. 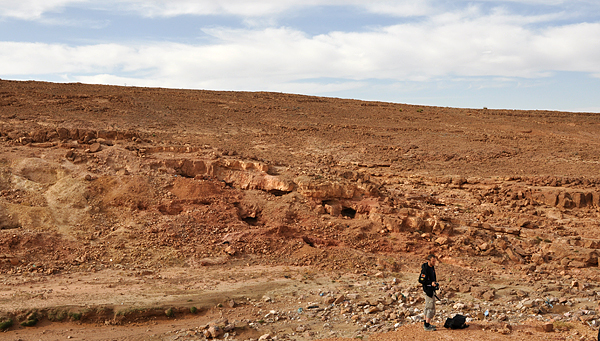 I spent two first days in Midelt with my friend Piotr Menducki from Jura Park Explorer Team looking for minerals and localities. We visited Mibladen area and because there was a great weather we spent a lot of time taking photos. 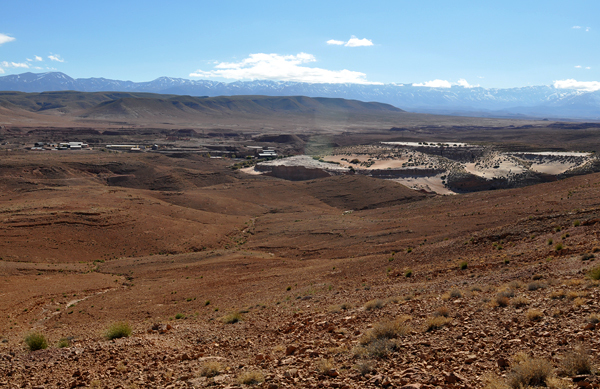 Last time when I was in Morocco there was a great find of wulfenites in Adeghoual, so we decided to spent some time in this not very well-known locality. 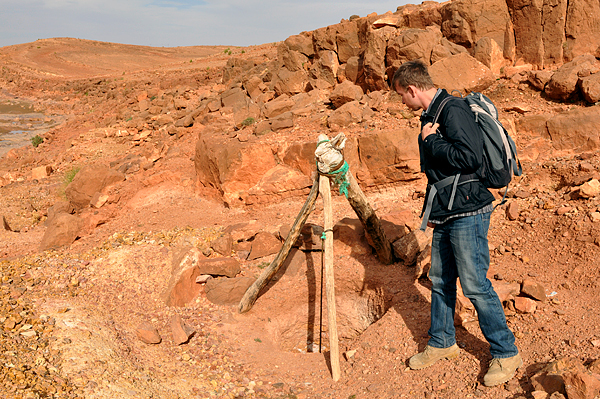 We visited the workings and surroundings, but didn’t find the exact place where the recent specimens came out from. Definitively this area have not been worked too much lately. 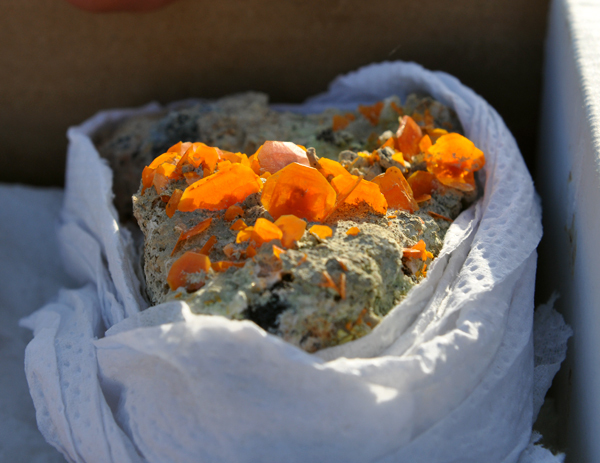 Coming back to Mibladen - a new find of vanadinites was discovered last month just after my last trip (when as you may remember we also had the opportunity to see some great specimens of vanadinites). 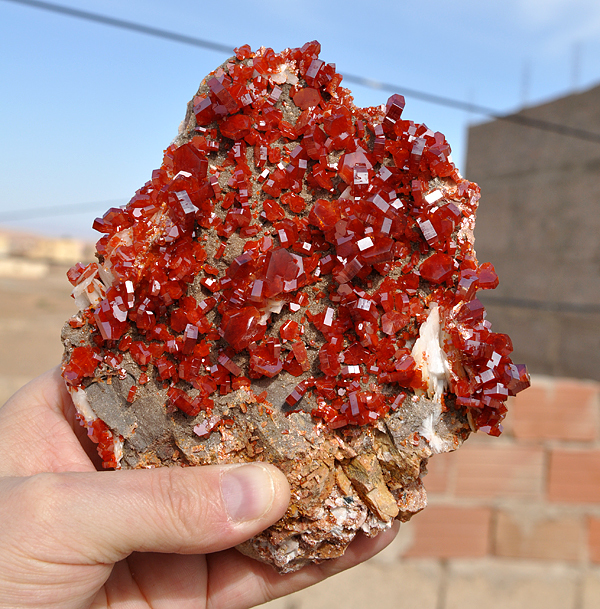 This time huge plates with deep red or brownish crystals without baryte were found. Specimens were not the really best ones but size of some of them was impressive. 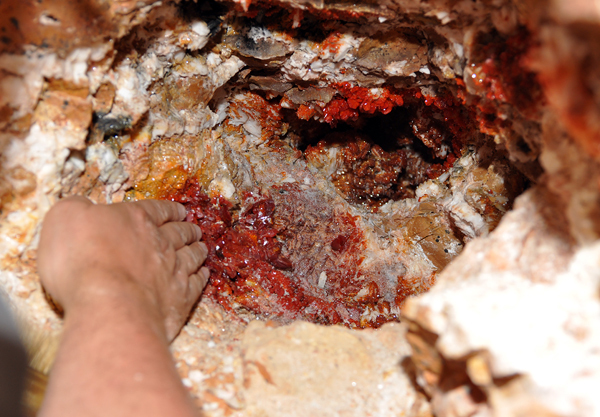 Moreover a small good find took place in one of the cerusite workings near Mibladen – huge, twinned sixling-type crystals of cerusite on baryte were collected there. 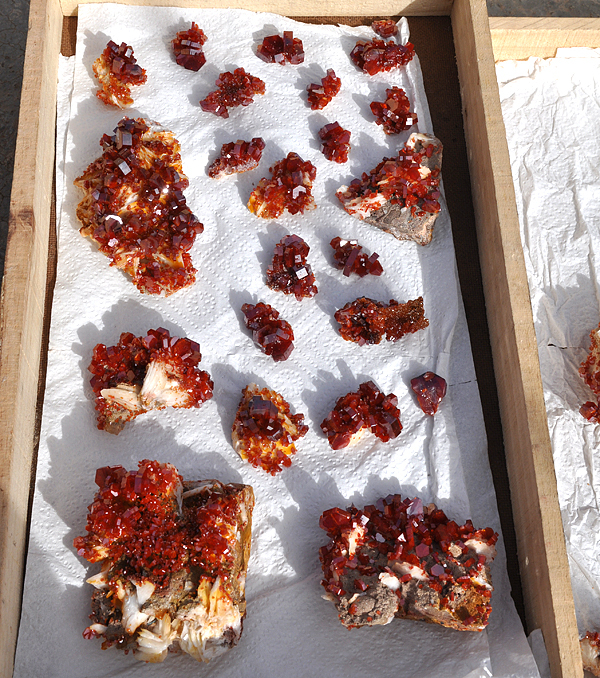 About 3-4 specimens were really good quality. 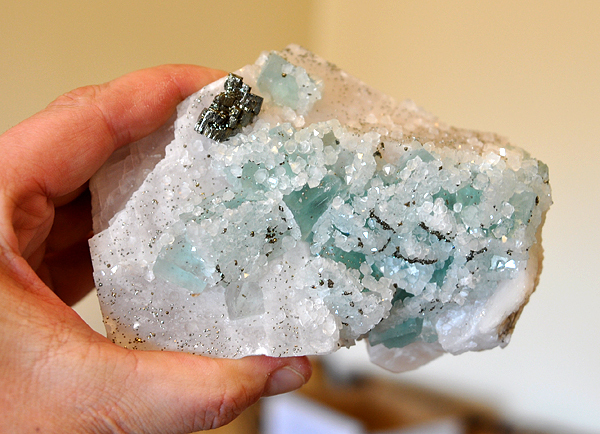 It is worth to notice that this habit of crystals is quite rare in Mibladen. But the main goal of my trip was different… Do you remember a superb pocket described in our last report (if not see here)? 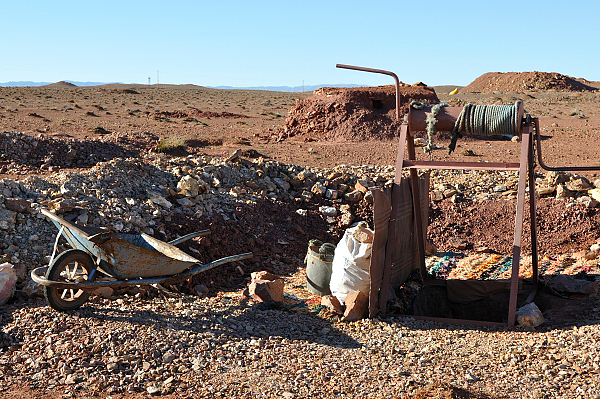 It was not yet cleaned when we were leaving Morocco after our last visit and the miners collected about 30 more specimens of top quality which were now waiting for me! 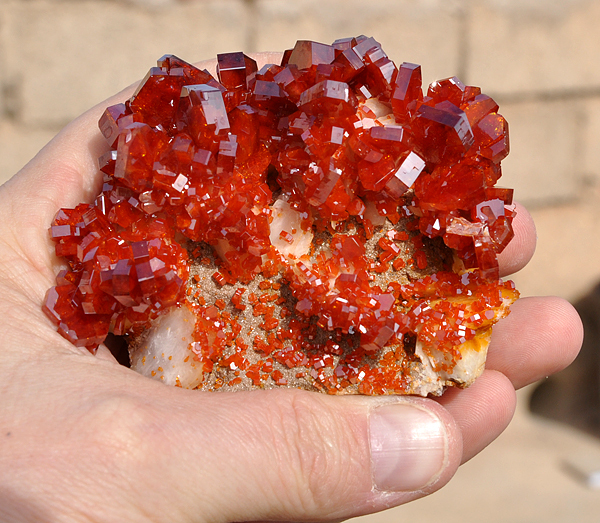 A real vanadinite-bonanza! 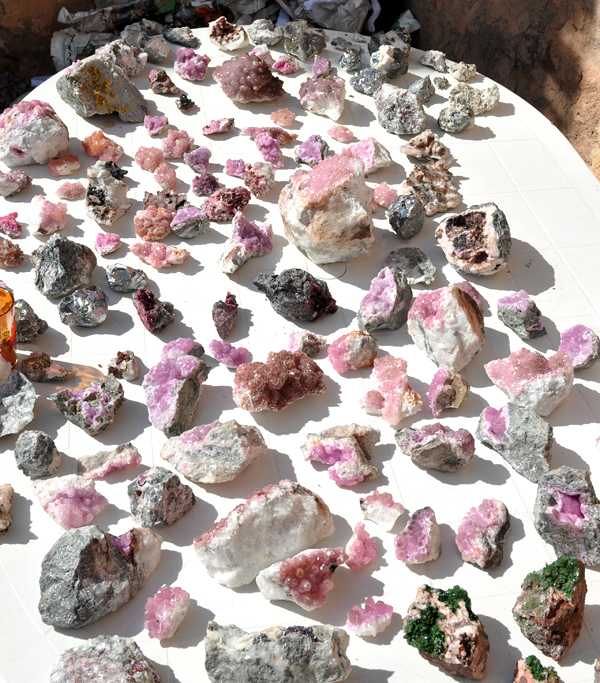 We spend a lot of time examining this jewels and negotiating. 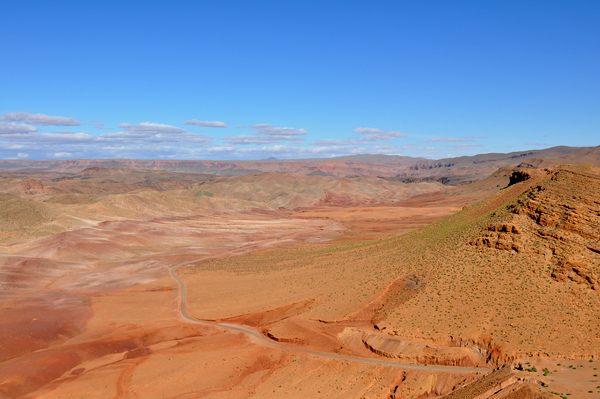 As usually before going to see some so-called “superb find” you always doubt if it is really worth to go thousands of kilometers to see it… this time it certainly was ! 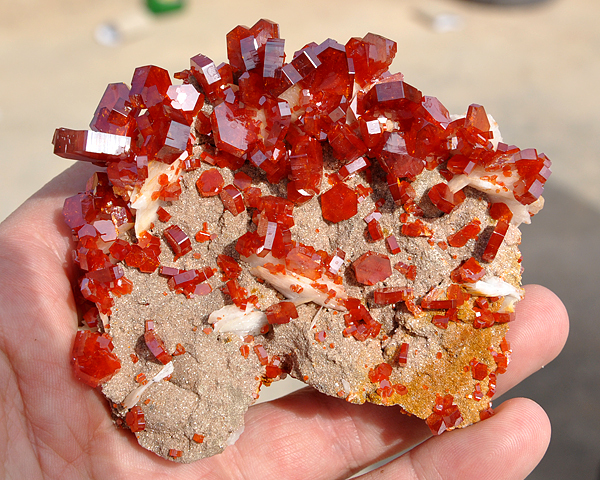 Specimens were of similar type like the previous ones – huge, well individualized, gemmy, neon-red crystals with superb luster vanadinites placed on white baryte. Some of specimens reached up to about 20 cm! 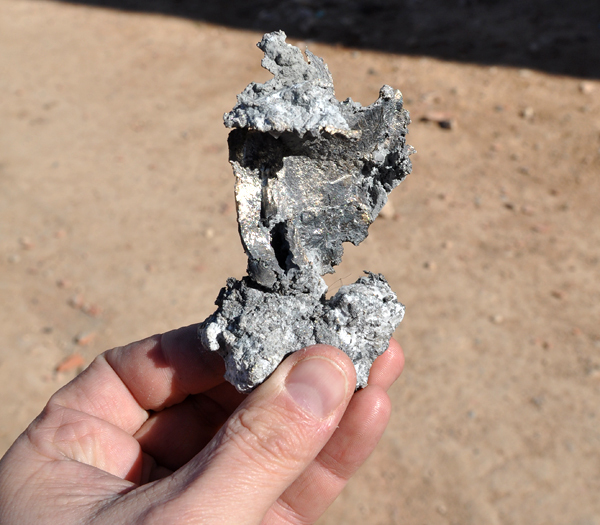 Beside of that we found small lot of native silvers from the Imiter mine. 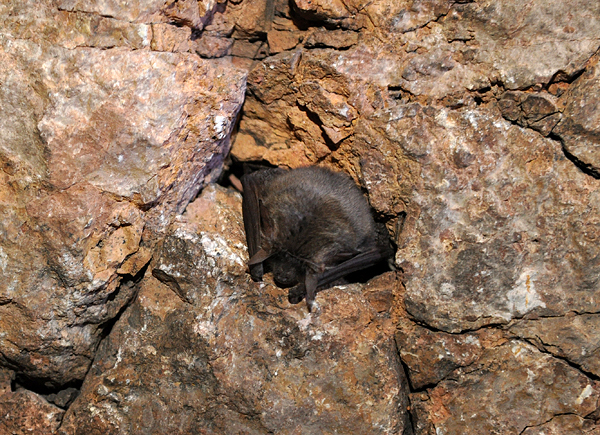 Before these specimens were very common, now because of very strict control in the mine they are really rare. 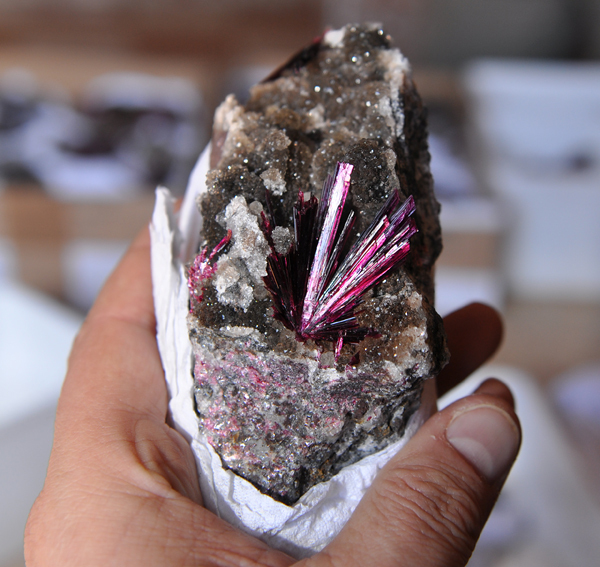 On the way from Midelt we visited our friends from Imilchil area who showed us some new hematites – iron roses – on quartz. As always almost all of them were broken or damaged. 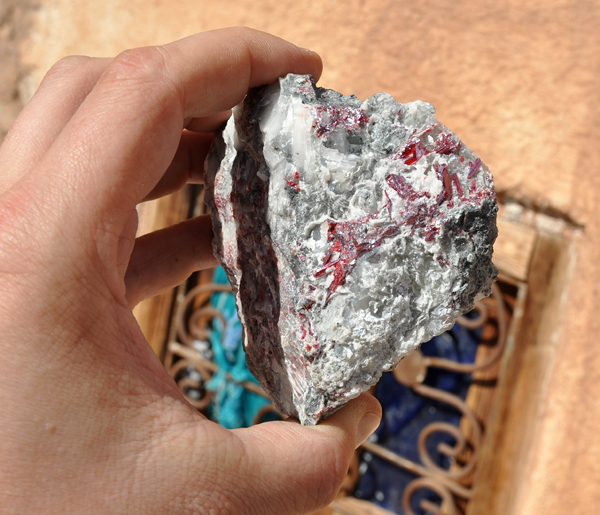 Hematite had good luster, and crystals up to 3 cm, but it was very fragile so had not survived the transport by miners who collected them… maybe in the future this locality will produce some good specimens? 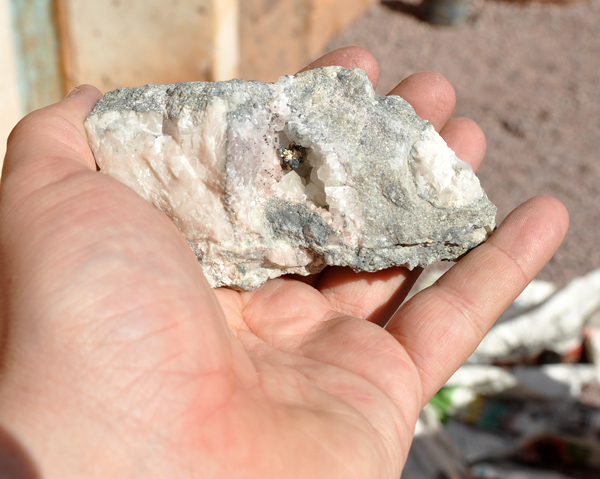 Beside of that, the locality with quartz started to produce huge window-type skeletal quartz specimens. Some of crystals were over 20 cm big! 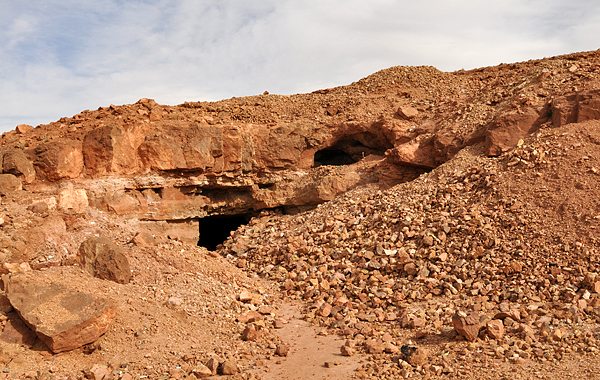 Next point on my way was Rissani and dealers who usually have specimens from the Erg Chebbi area – unfortunately nothing new was found there. 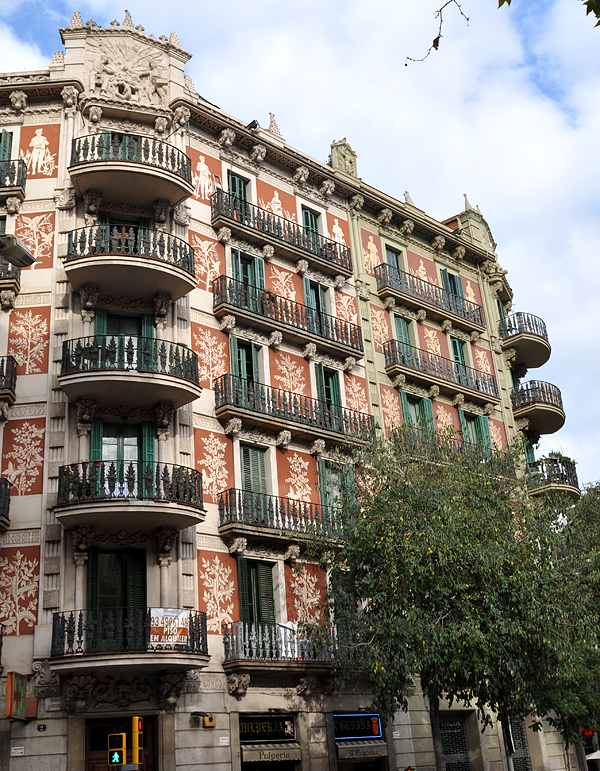 Important goal of this trip, apart from vanas, was to fix the last details for the Mindat Conference – so I spent a big part of the time visiting hotels, restaurants etc. 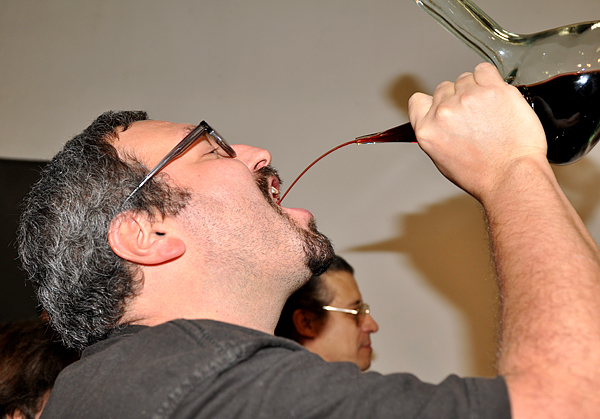 by the way – you should really join us in 2012, this will be an awesome event! Apart from that the native silver wires from Aghbar are worth to mention. They are usually microscopic, but this time they reached up to 1 cm with association of unknown black mineral (acanthite?). 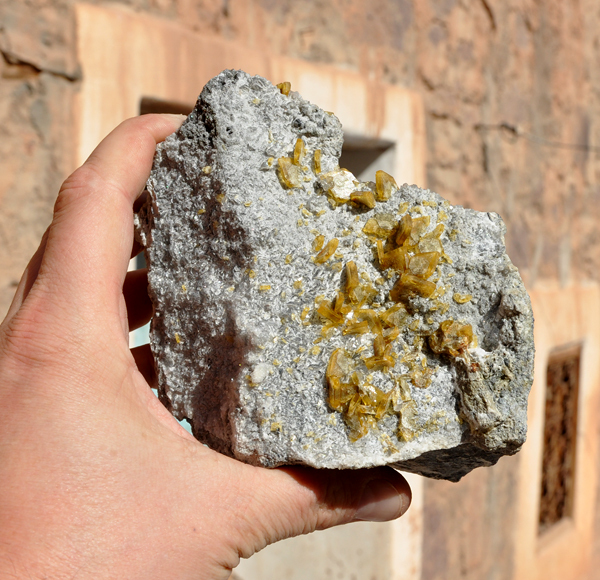 A specimen with quite big, well formed yellow baryte crystals from Bouismas mine was also very interesting. 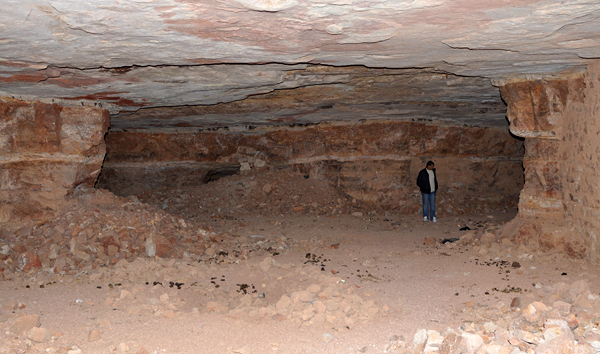 Bad news from that mine is that the vein with allargentum pseudomorphs after dyscrasite is gone, and they might never appear again. 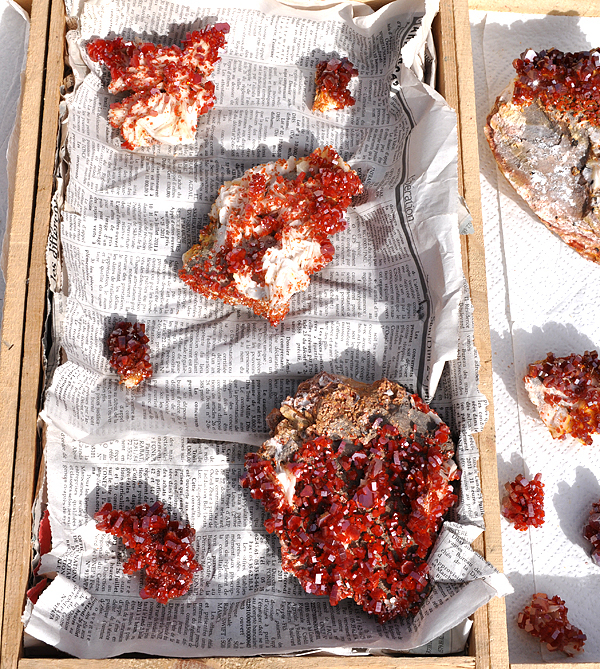 Definitively it is worth to keep some specimens from that find – surely they will become classic some day. 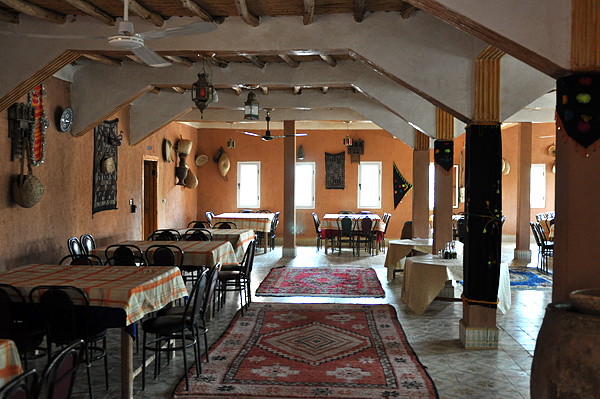 From Bou Azzer I had crazy drive to Casablanca booking some more restaurants and hotels for the conference on the way. 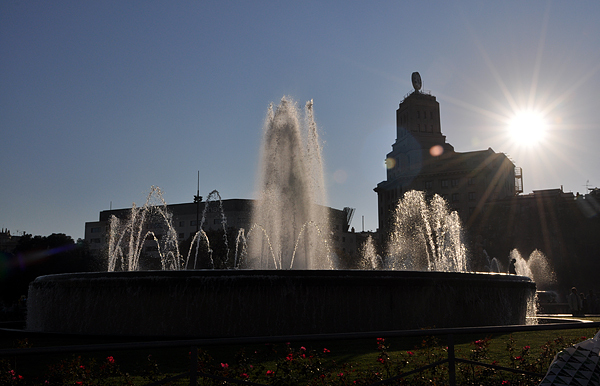 I started early morning in Casablanca. My phone broke and I neither could contact the world nor even be contacted by anyone. Because of some unexpected purchases I cleaned my credit card so I had only 100 euro left. Flight to Madrid was horrible – there was very strong turbulence. I am rather resistant to this kind of attractions, but this time it was really unpleasant. 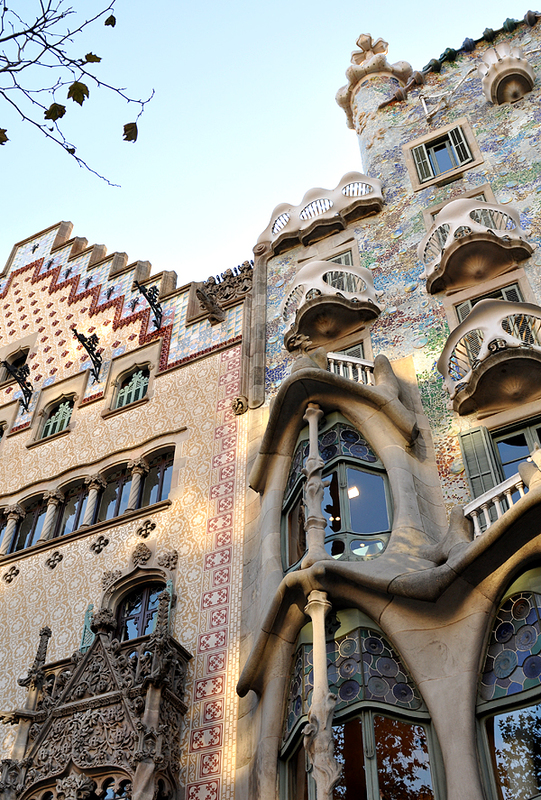 In Madrid I had to wait 4 hours and what`s more flight to Paris was delayed… My plan was to go by a shuttle bus to the Beauvais airport (about 80 km outside of Paris) where I booked a hotel. I had to change the train twice and than go by underground to the bus stop. When I arrived there it was already 21.30 and the last bus left at 20.30… I caught a taxi, but it was 120 euro while I had maybe 70 left. Phone did not work so I could not call any friends in Paris. Fortunately there was also a group of Turkish students who were in a very similar situation. Finally we found a taxi for 100 euros and because they had no money I paid most of that price. I was out of money. After arriving to the airport (00.30 A.M.) it turned out that it was closed, so my new friends could not sleep there and wait for the flight as they planned, but they decided to stay anyway. Then a new problem appeared. I didn’t know the address of my hotel as I had it in my broken mobile. There was huge fog in the town. We used GPS to find the place, but it got crazy showing once that we are almost there, and 3 seconds later that we have still 10 km to go... The driver was really tired and mad at me. He asked for extra 10 euros. I was happy to pay but… I had no money. Fortunately I found out that he was from Morocco from Casablanca. I had some dirhams… Finally I paid him in this currency and after another 15 min we found the hotel. The driver was so nice that he exchanged my leftovers of dirhams to euros and I had 15 euro for the taxi next day (airport was 7 km from hotel)! The last problem was to pay for the hotel, I did not know how I would do this but fortunately it turned out that the card was charged already and I could go to the warm room… I was exhausted. Next day was much easier but still not too easy. I asked in the reception to call for taxi but I was said they could not do it (remember my phone did not work); the numbers of taxis were listed on the noticeboard and I noticed that there was a free-wifi zone so I used Skype and finally the 5th taxi company agreed to take me to the airport in less than 1 hour! Taxi was supposed to be around 15 euro (I had with all coins 16.50 euro). On the way I saw that there was already 20 euros on the taximeter… but I didn’t say anything – I had no choice, I had to be on the airport on time. At the end I was apologizing a lot, but the driver turned out to be very nice and had no problem with a poor Polish tourist. 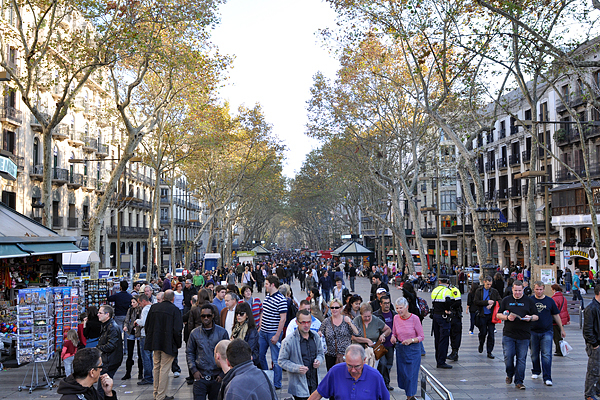 La Rambla - tourist heart of Barcelona. J. Gajowniczek photo. 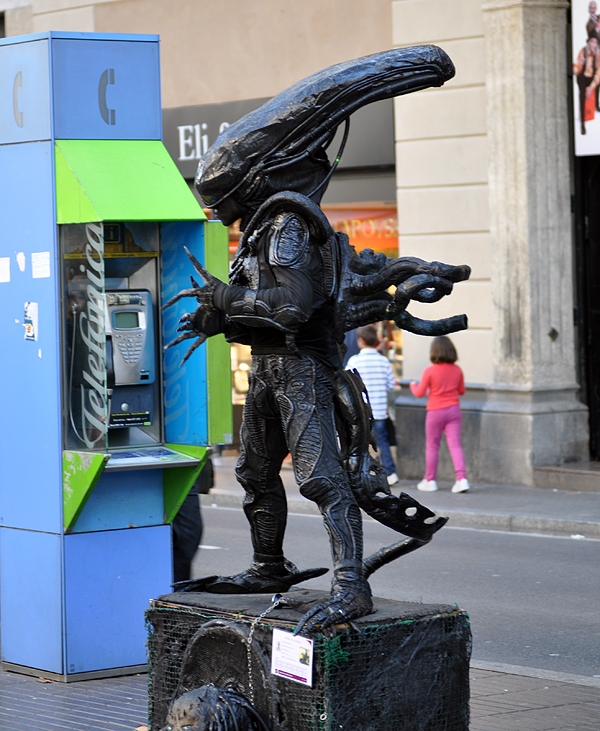 An interesting performer on Rambla. J. Gajowniczek photo. 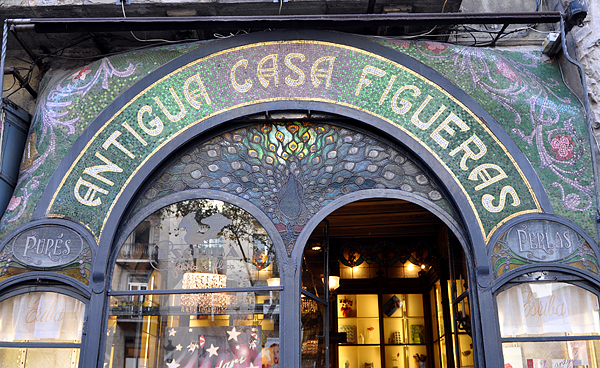 Superb mosaic on Rambla. J. Gajowniczek photo. 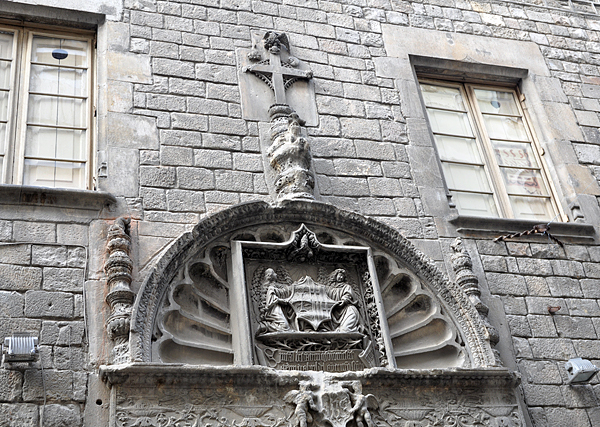 Details of the church. J. Gajowniczek photo. 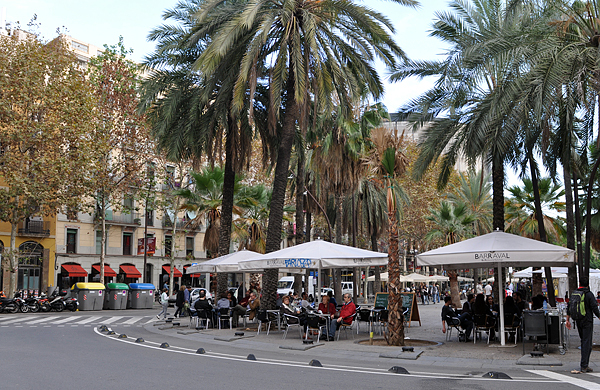 Good place to relax in Barcelona. J. Gajowniczek photo. 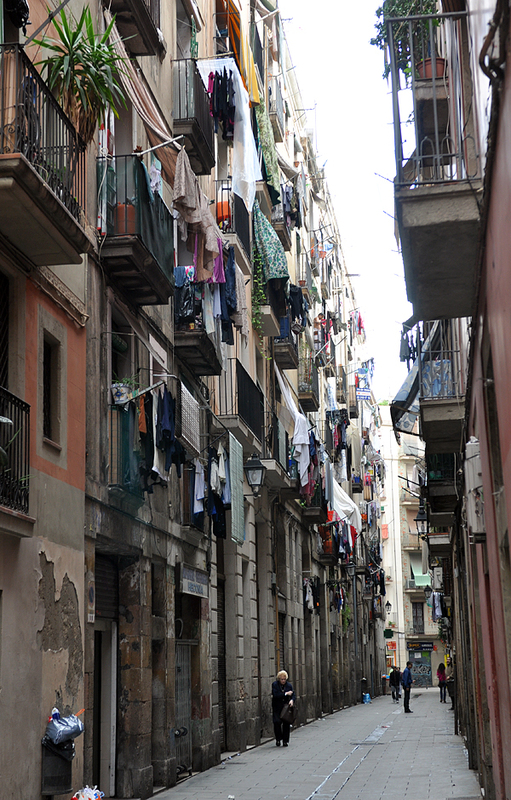 Narrow streets typical for the old part of Barcelona. J. Gajowniczek photo. 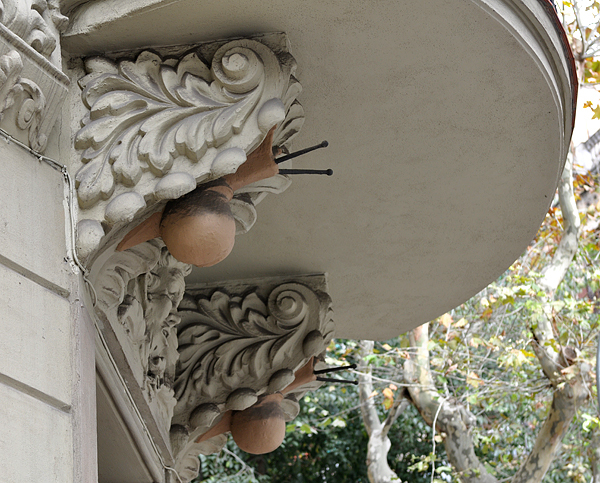 View up. J. Gajowniczek photo. 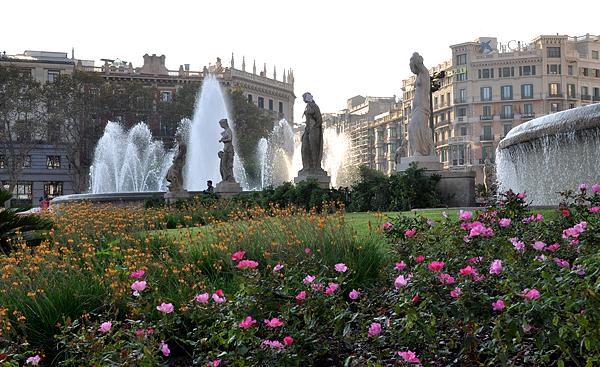 Fountains at Plaza de Catalunia. J. Gajowniczek photo. 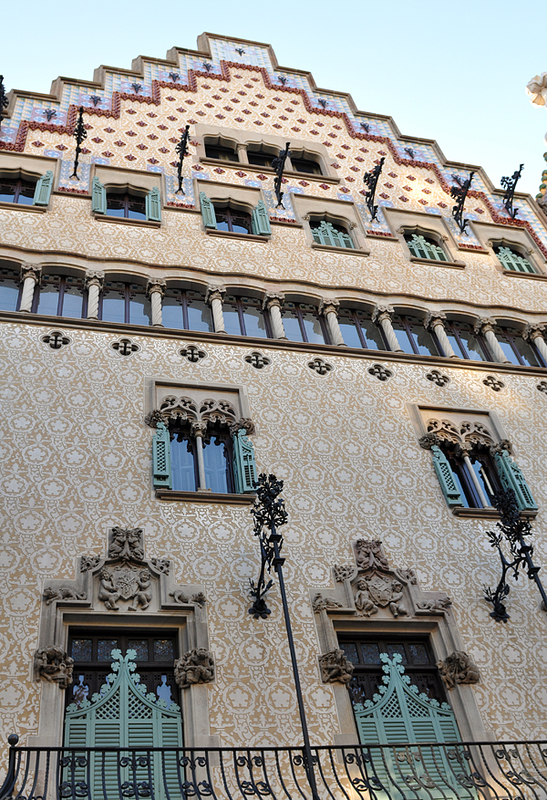 Beautiful architecture is common in old Barcelona. J. Gajowniczek photo. 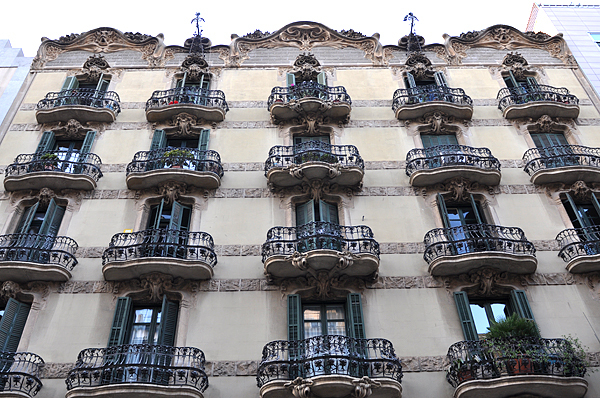 A very nice apartment house that is a neighbour of the famous Casa Batlo. J. Gajowniczek photo. 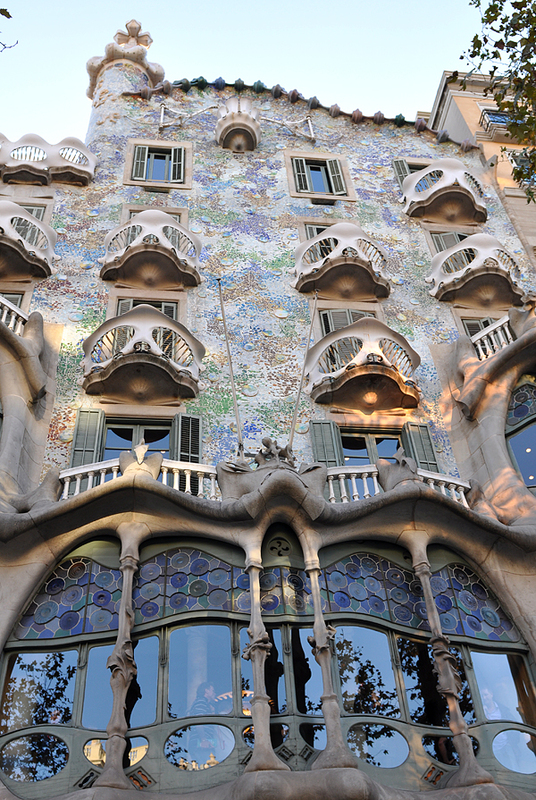 Casa Batlo - one of the most famous Gaudi`s buildings. J. Gajowniczek photo. 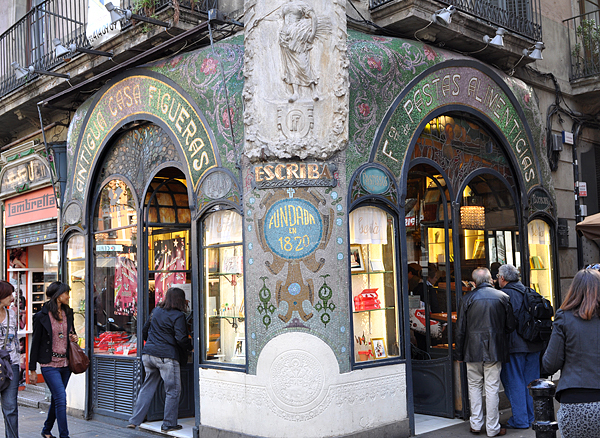 Casa Batlo and its neighbour - also very interesting. J. Gajowniczek photo. 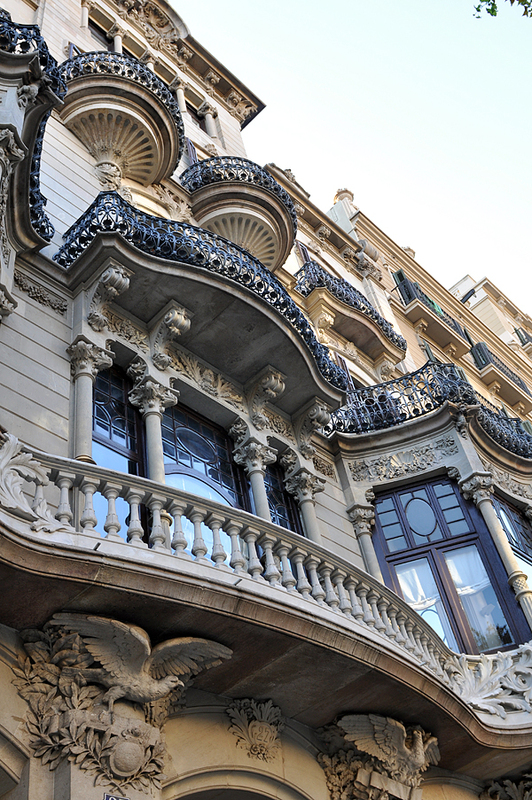 Some more Barcelona`s architecture. J. Gajowniczek photo. 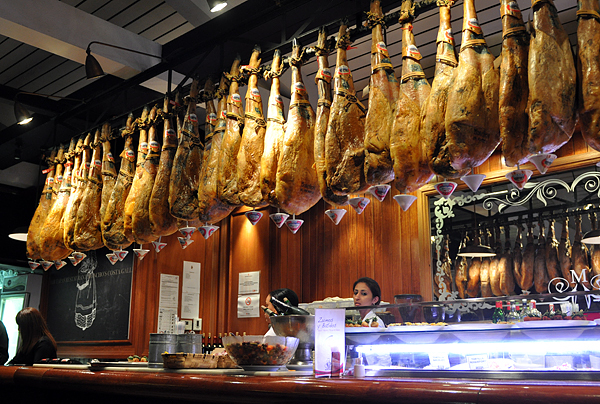 We stopped in many little and bigger restaurants and cafes, here you can see the famous jamon/pernil in the form of the whole pigs` legs . J. Gajowniczek photo. 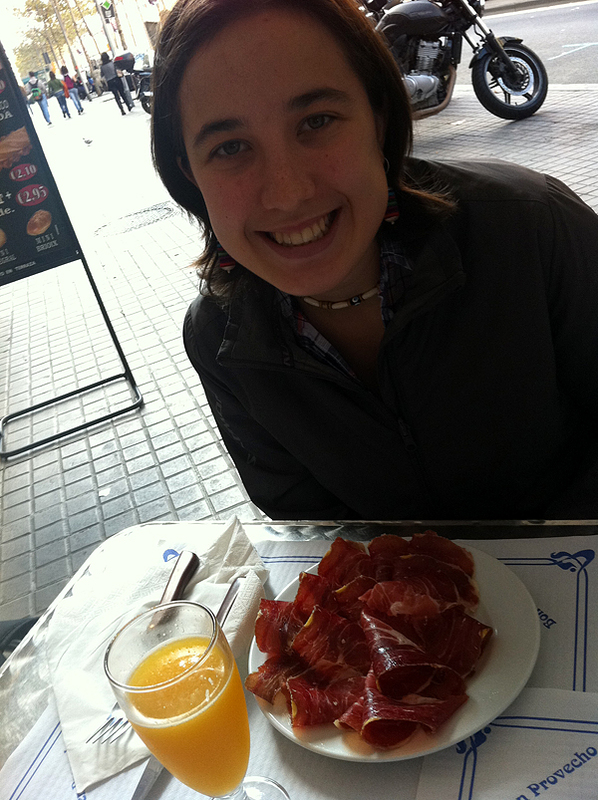 Very happy Asia with jamon! T. Praszkier photo. 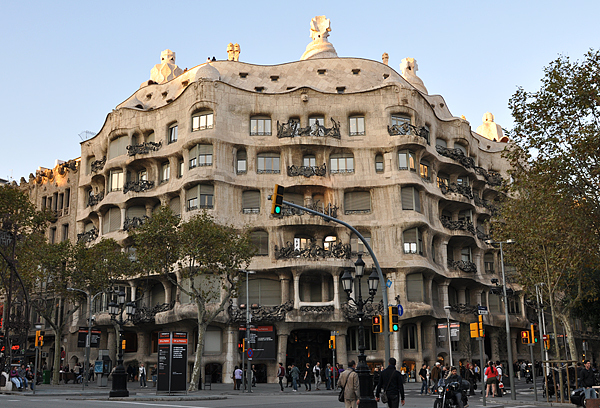 The other well-known Gaudi`s building - Casa Mila. J. Gajowniczek photo. 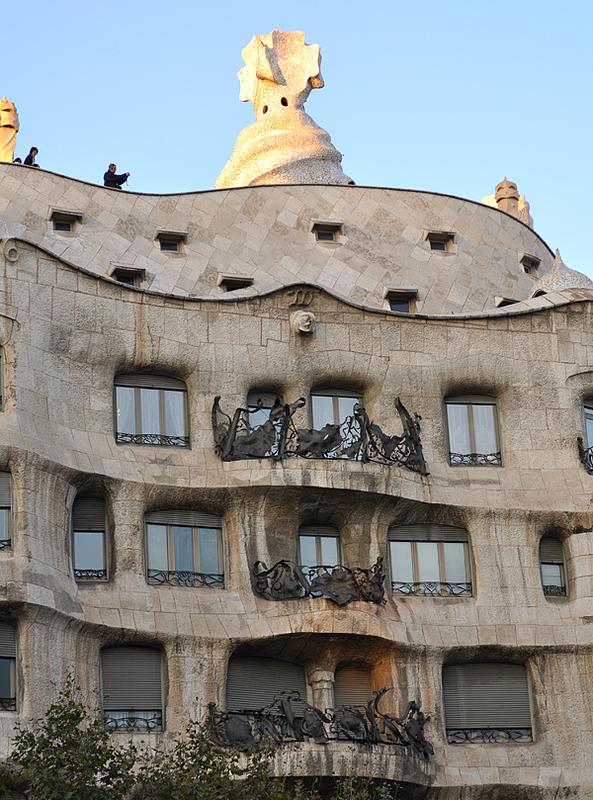 The `house of snails` - as we called it - note the sculptures under ballconies. J. Gajowniczek photo. And a close-up. J. Gajowniczek photo. 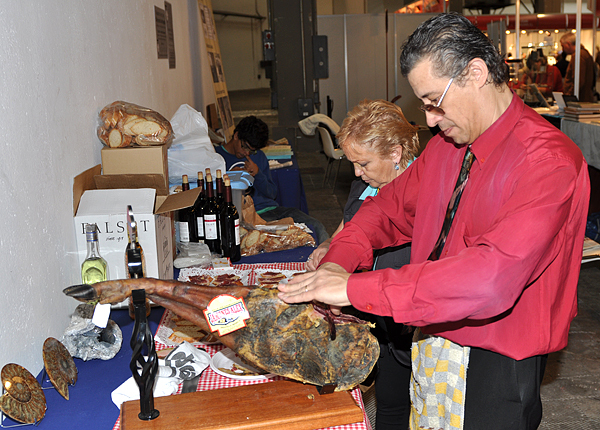 The party of Grup Mineralogic Catala - preparing sandwitches with pernil!. J. Gajowniczek photo. 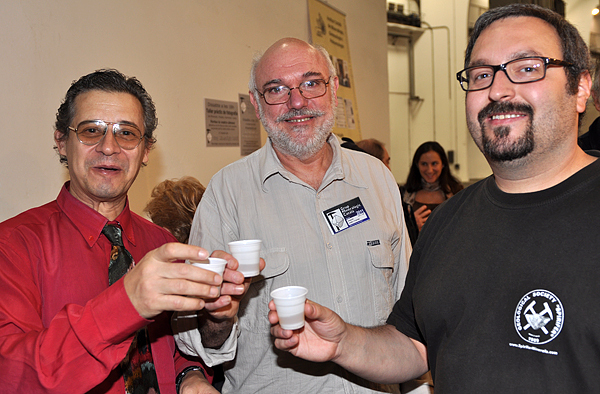 The party of Grup Mineralogic Catala. J. Gajowniczek photo. Drinking vodka - of course we had to take some of Polish favourite drink. J. Gajowniczek photo. 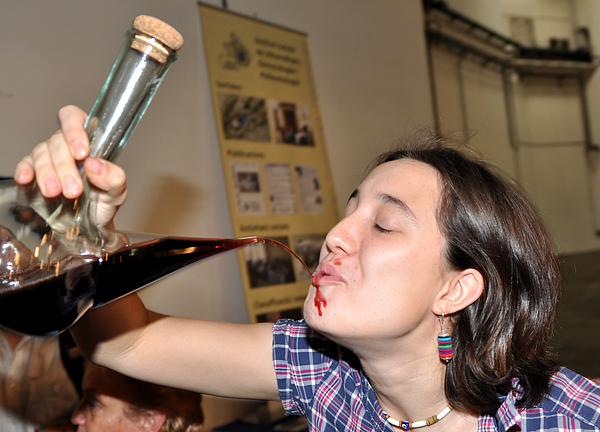 Drinking wine in traditional style. I was quite good in this. J. Gajowniczek photo. Asia had less luck... T. Praszkier photo. 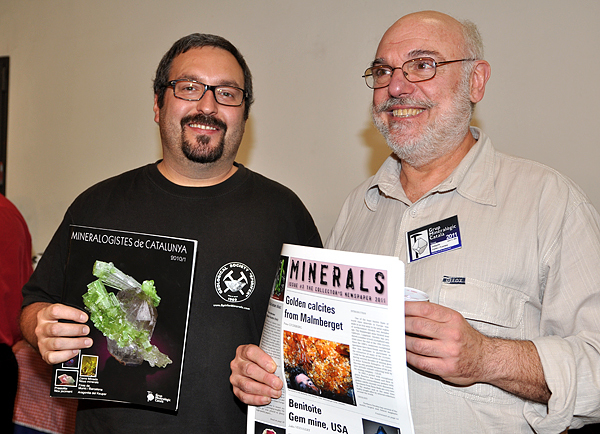 Tomek with Mineral Up and Joaquim Callen with Minerals newspaper. J. Gajowniczek photo. 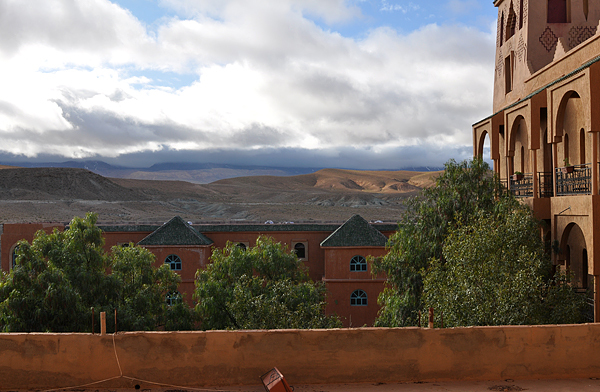 Again in Morocco, again in Midelt. T. Praszkier photo. This time there was a great visibility. T. Praszkier photo. 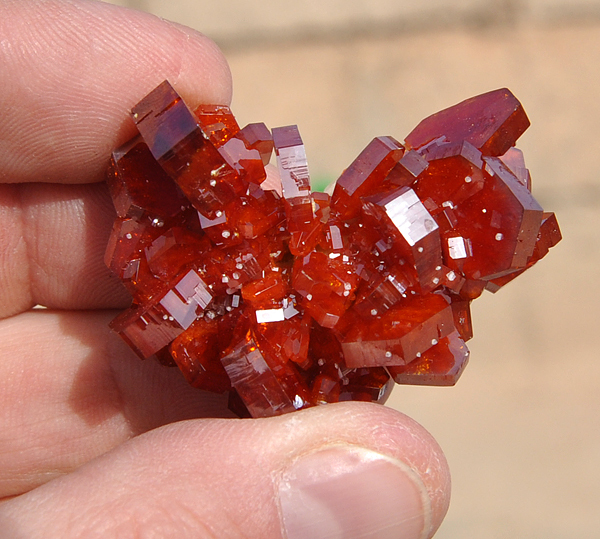 Do you remember wulfenites from the last report? If not see here. T. Praszkier photo. We decided to examin the locality where these specimens came from - Adeghoual. T. Praszkier photo. 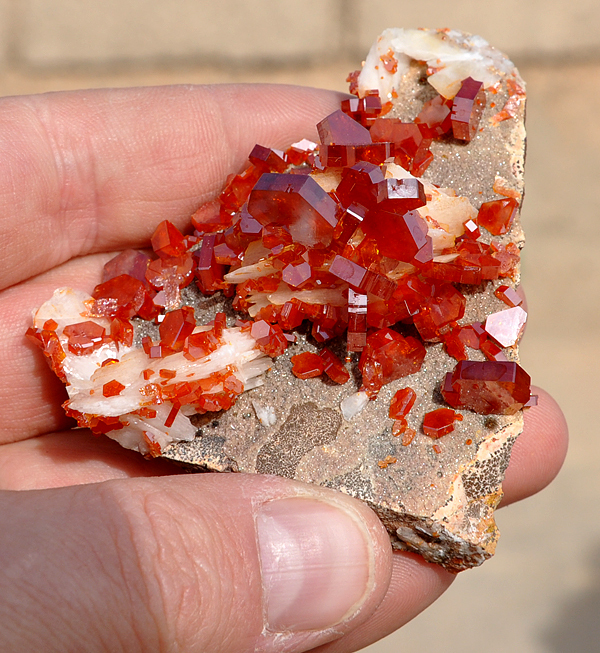 Workings for galena - this is where these great wulfenites came from. T. Praszkier photo. 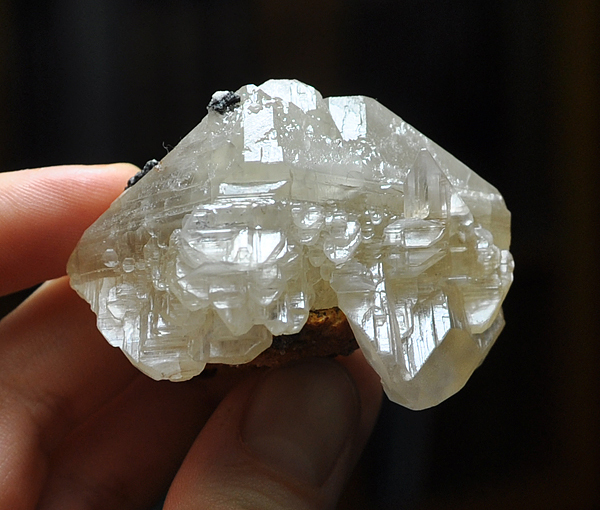 Galena - baryte veins. T. Praszkier photo. Bat in the workings. T. Praszkier photo. Workings for vanadynite in Adeghoual. T. Praszkier photo. View from my hotel in Midelt. T. Praszkier photo. 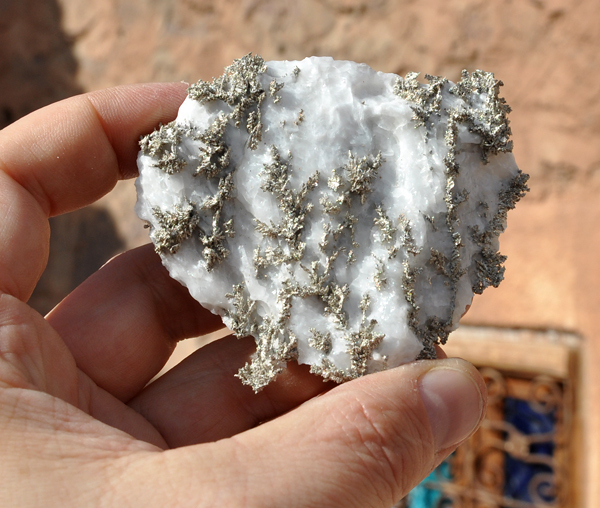 Another recent find of vanadynites. T. Praszkier photo. 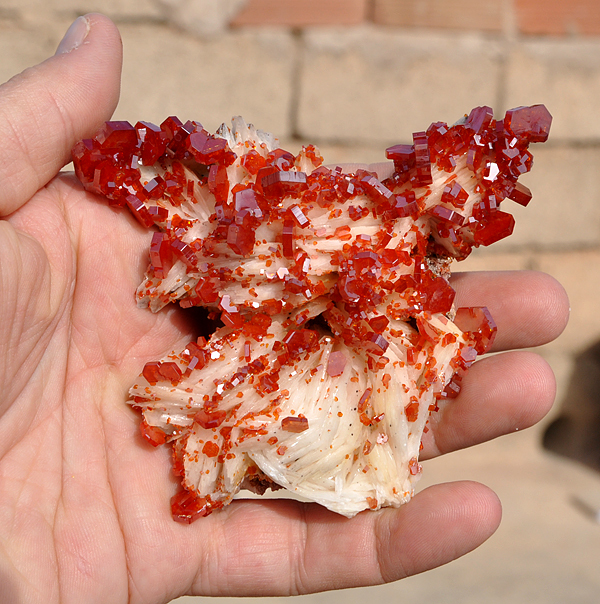 This time huge plates with deep-red crystals. T. Praszkier photo. And some really huge plates! T. Praszkier photo. 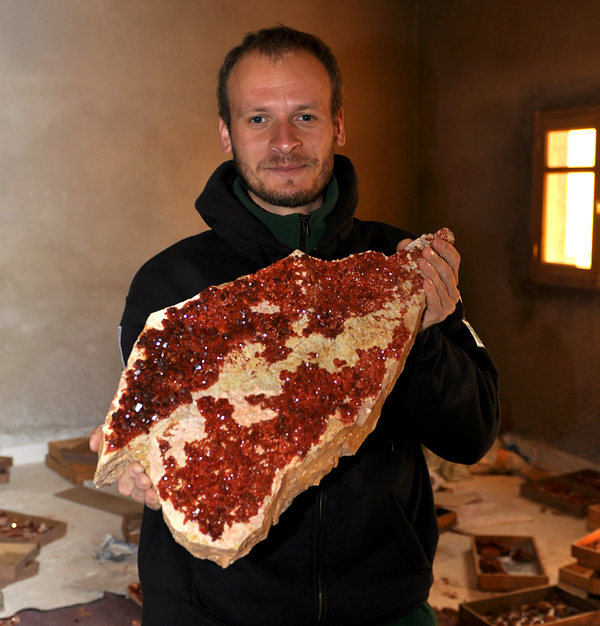 My friend Piotr with one of the biggest specimens from the find. T. Praszkier photo. 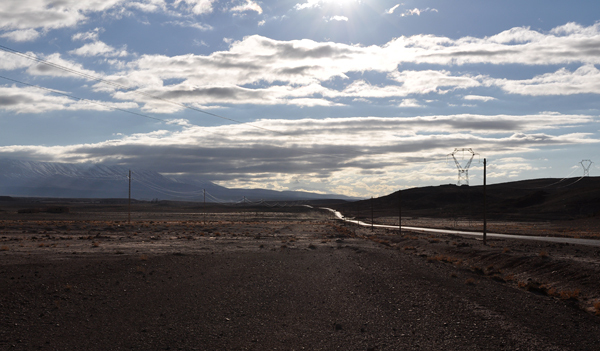 View from the road to mibladen. T. Praszkier photo. 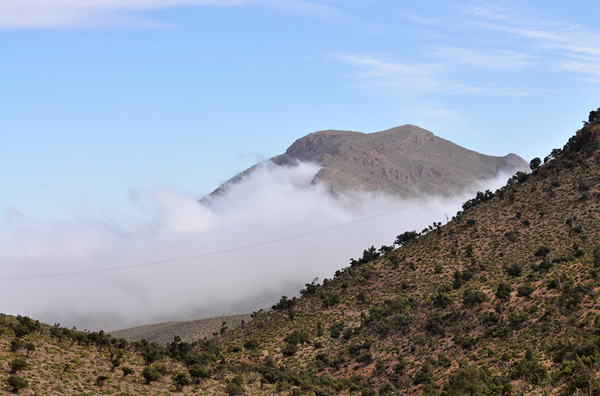 View from Mibladen to Jebel Ayachi. T. Praszkier photo. 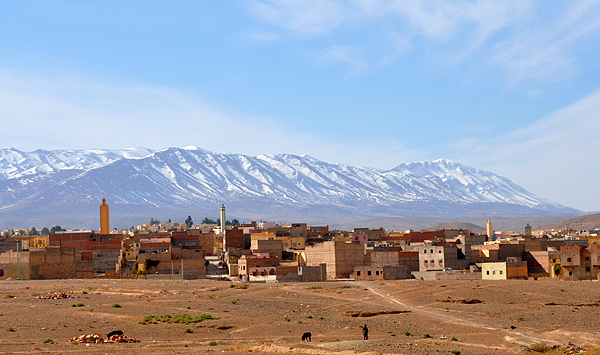 Another view to High Atlas. T. Praszkier photo. View to Mibladen village. T. Praszkier photo. 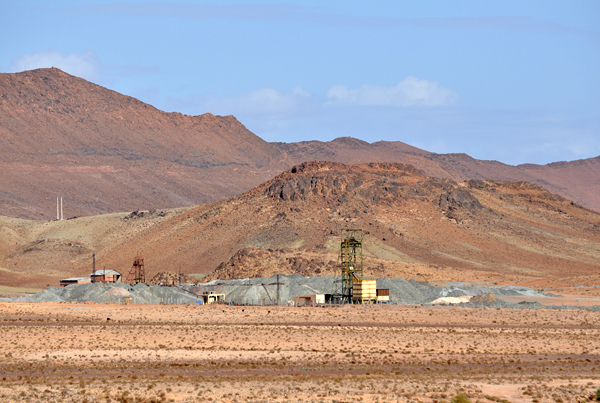 View to the mining center in Mibladen. T. Praszkier photo. 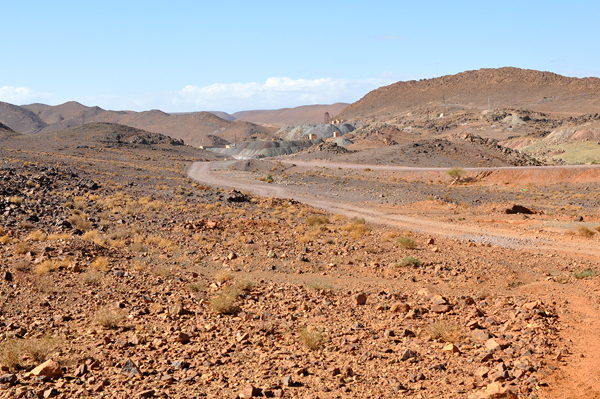 View to the Jurassic deposits (layers on the right, which contain famous vanadium-lead mineralization) and messeta - a block with old, Precambrium rocks. 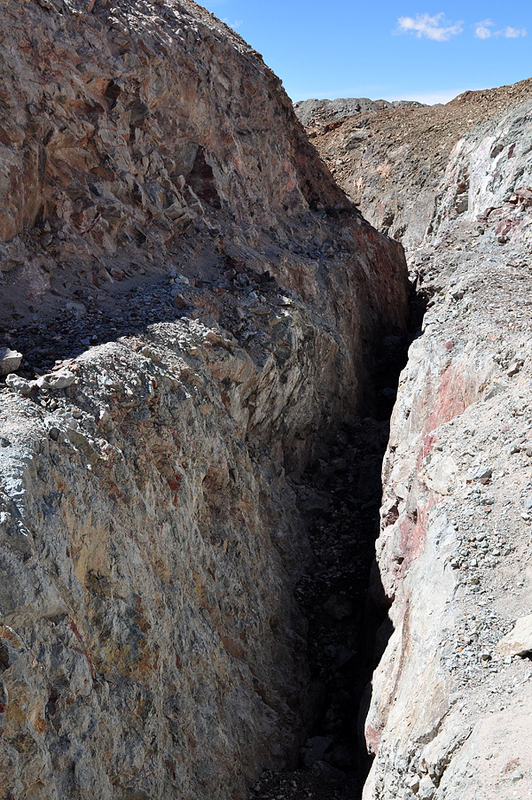 Cliff between these units is where a big fault is placed. T. Praszkier photo. 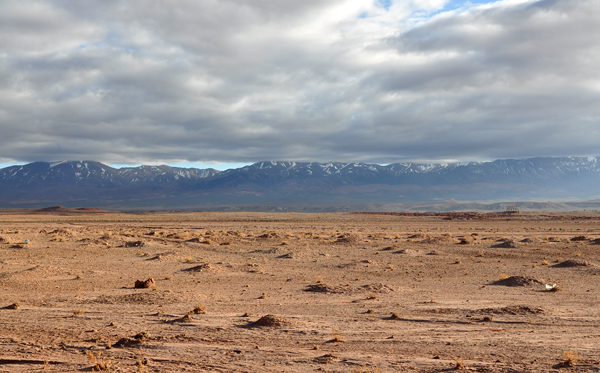 View to messeta. T. Praszkier photo. 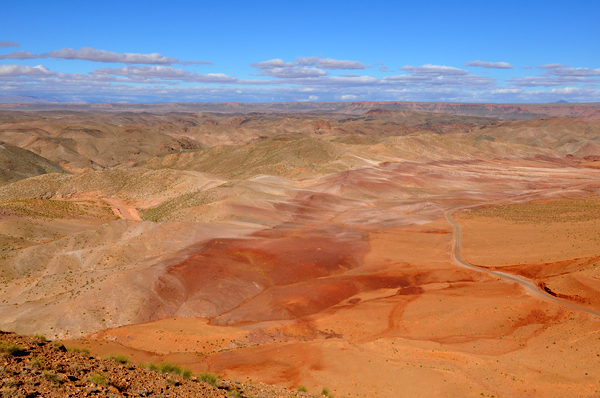 Our visit in Les O mine in Mibladen - we went there to check the new find of cerusites. T. Praszkier photo. One of many entrances. T. Praszkier photo. Inside Les O workings. T. Praszkier photo. 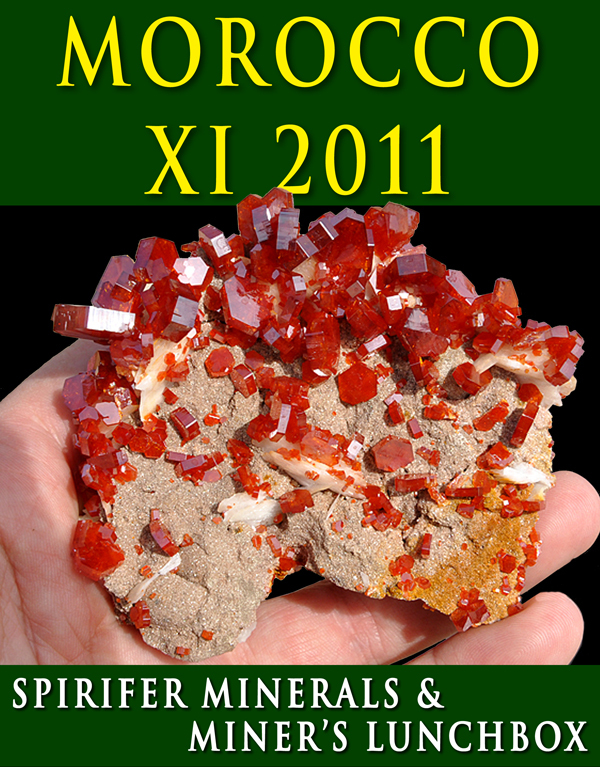 New sixlings of cerusites from Les O mine. A. Gajowniczek photo. 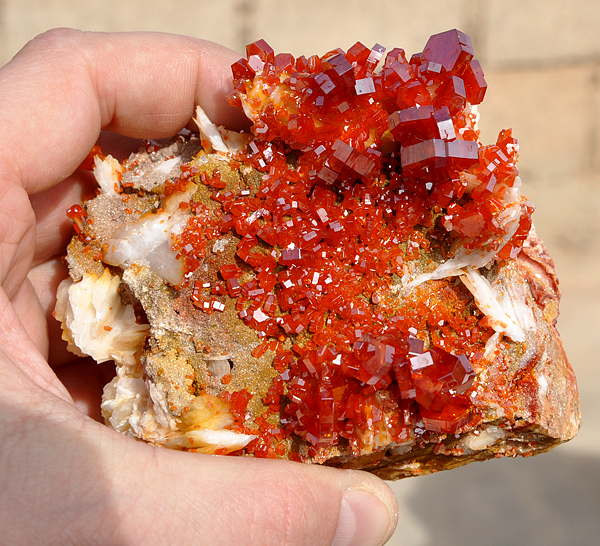 New twinned cerusites from Les O mine. A. Gajowniczek photo. 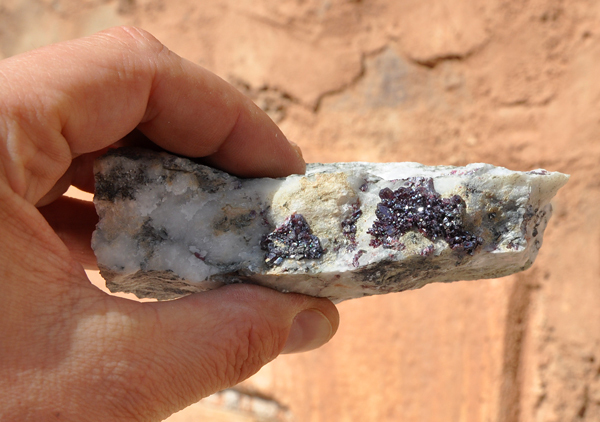 New twinned cerusites from Les O mine. 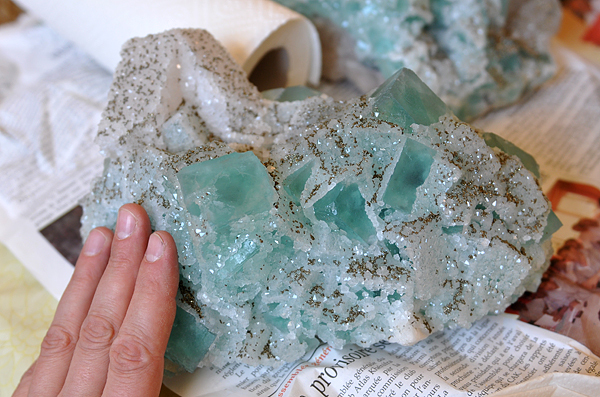 Note the size of crystal. A. Gajowniczek photo. Workings in Coudya. T. Praszkier photo. Great pocket ilustrated in the previous report - for details see here. T. Praszkier photo. 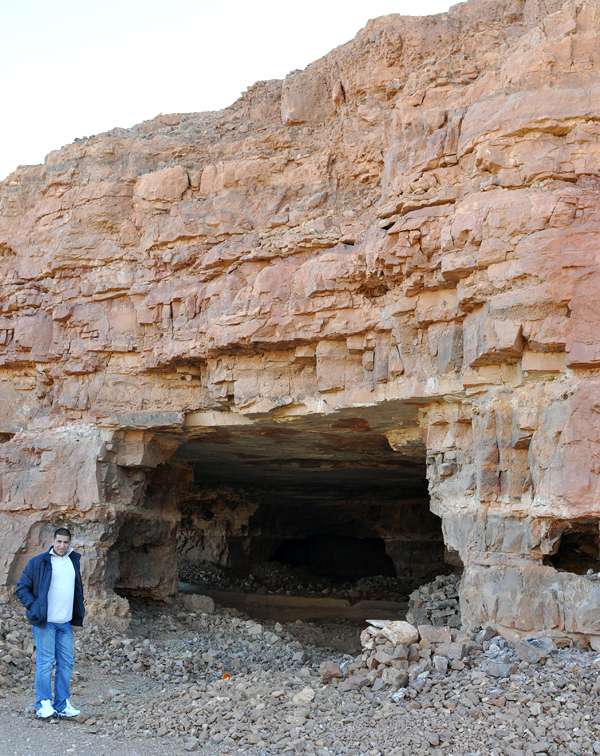 Flat with the specimens from the "great pocket" pictured above. T. Praszkier photo. 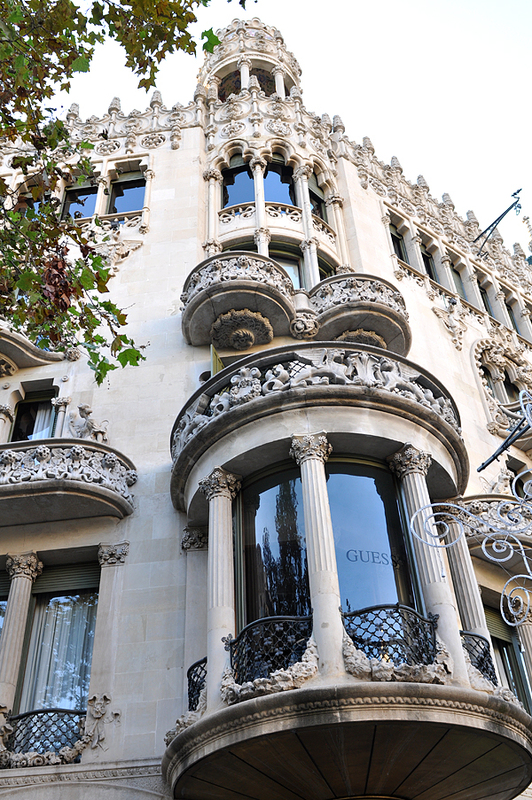 Another flat with specimens from the same pocket. T. Praszkier photo. 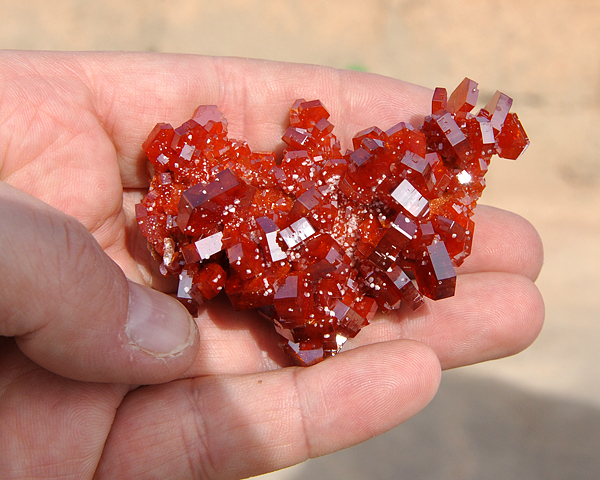 Unusual elongated crystal on matrix from the same pocket. T. Praszkier photo. One of many smaller specimens, great quality. T. Praszkier photo. 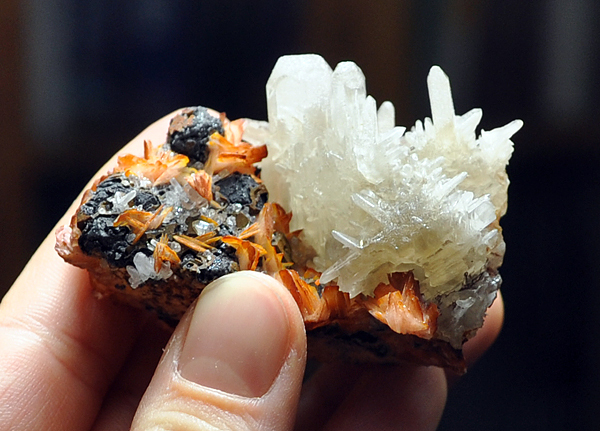 Huge crystals on baryte. T. Praszkier photo. 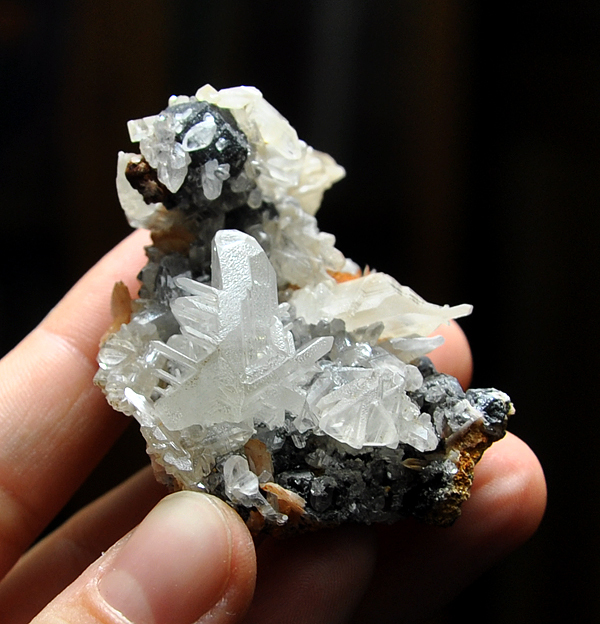 Gemmy crystals of vanadynite on baryte. T. Praszkier photo. 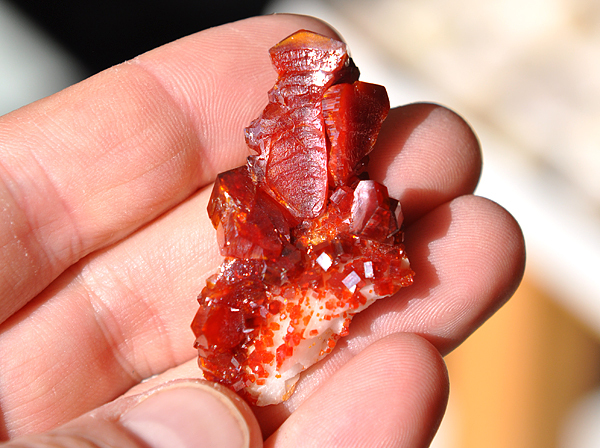 Another specimen from the pocket. T. Praszkier photo. 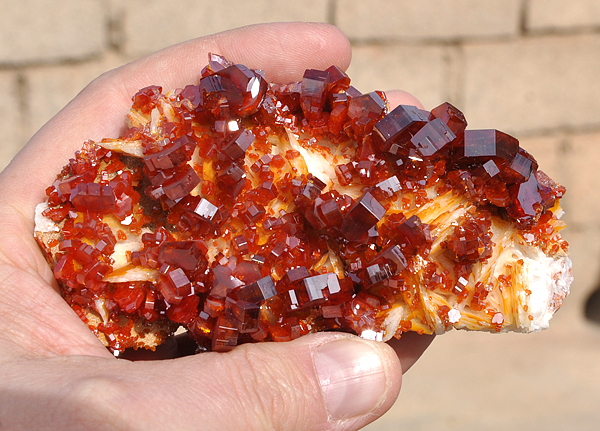 Superb color and gemminess of this specimen. T. Praszkier photo. 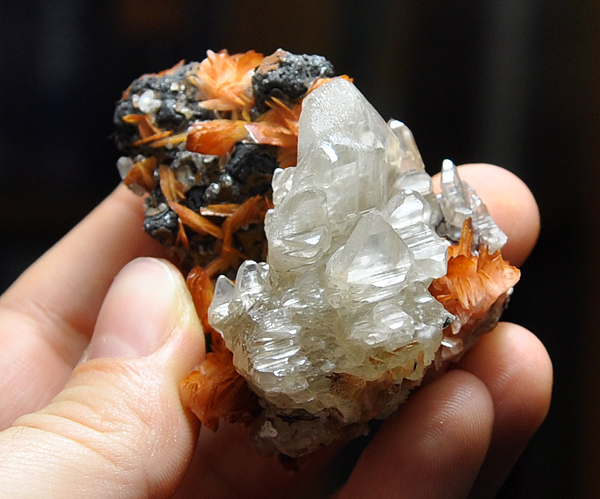 Classic combo - vanadynite on baryte. T. Praszkier photo. Big specimen from the find. T. Praszkier photo. 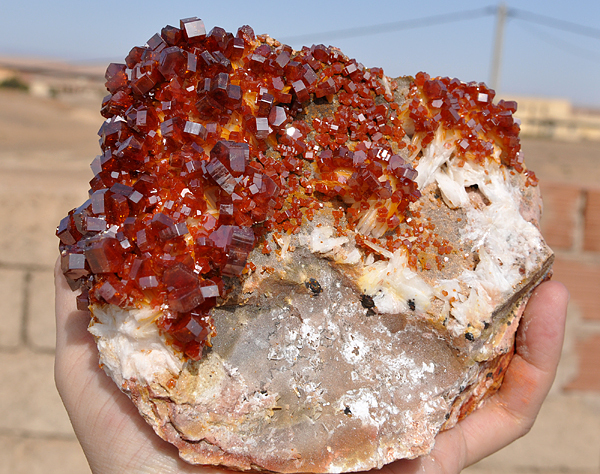 Huge and gemmy crystals. T. Praszkier photo. 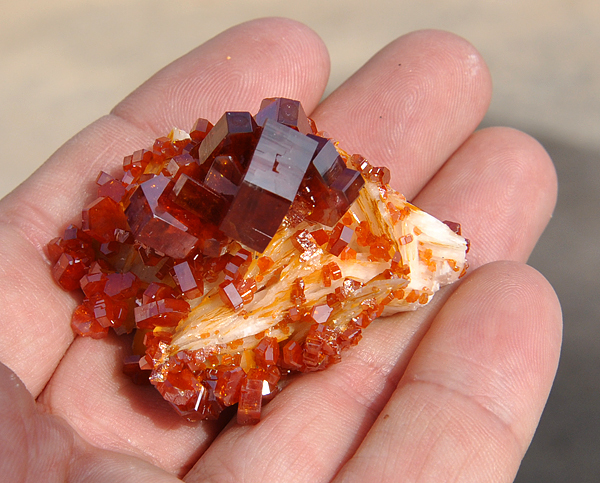 Superb vanadynite. T. Praszkier photo. One of the best specimens from the pocket. T. Praszkier photo. 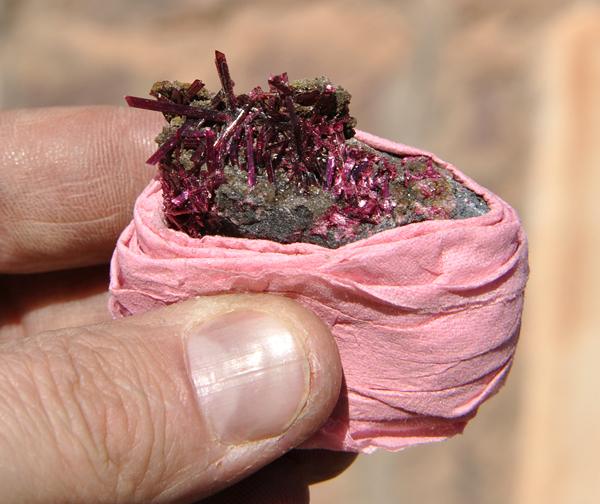 Another specimen from the pocket, about 8 cm wide. G. Bijak movie. 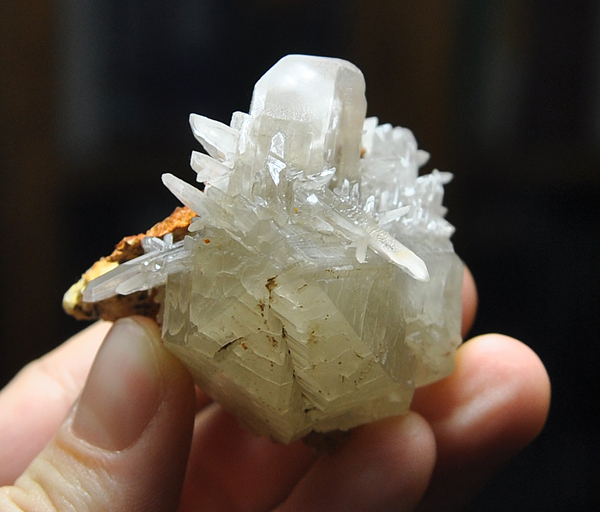 Superb specimen of vanadynite on contarstive matrix, crystals up to 2.3 cm. G. Bijak movie. Finally good dinner with friends! T. Praszkier photo. 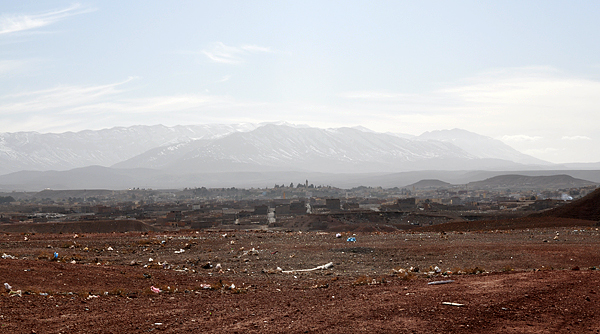 View to Midelt with High Atlas in the background. T. Praszkier photo. 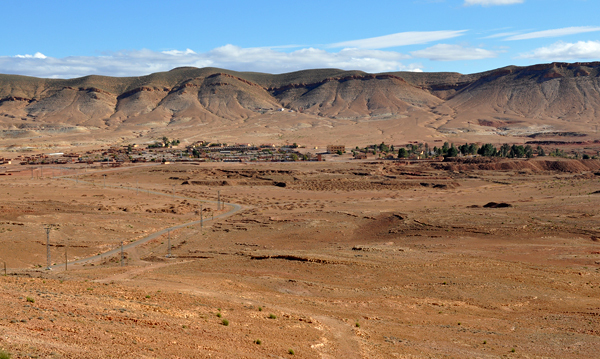 Another view to Midelt town with Jebel Ayachi in the background. T. Praszkier photo. 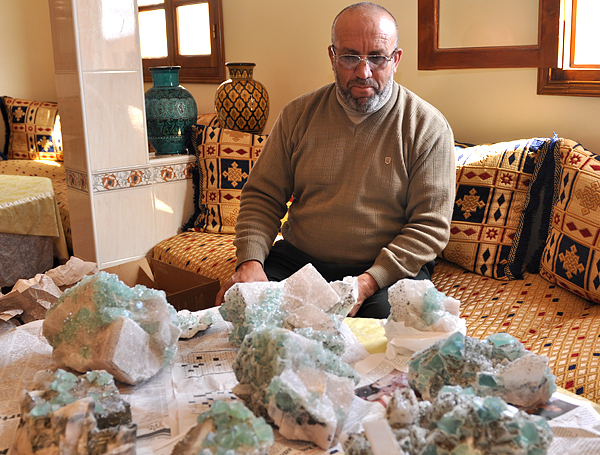 Owner with specimens of fluorite on calcite from the new find in El Hammam. T. Praszkier photo. 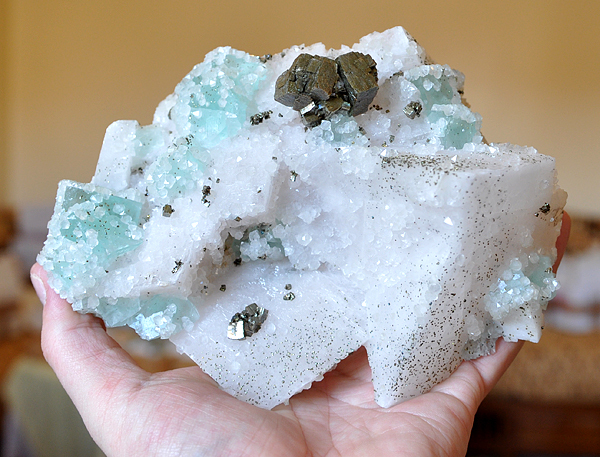 Calcite with fluorite and pyrite from the new find in El Hammam. T. Praszkier photo. 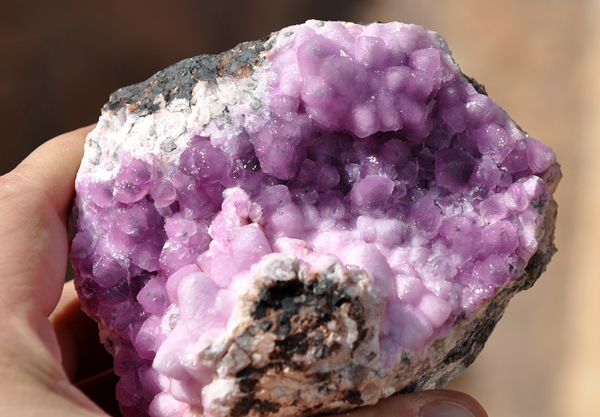 Calcite with fluorite from the new find in El Hammam. T. Praszkier photo. 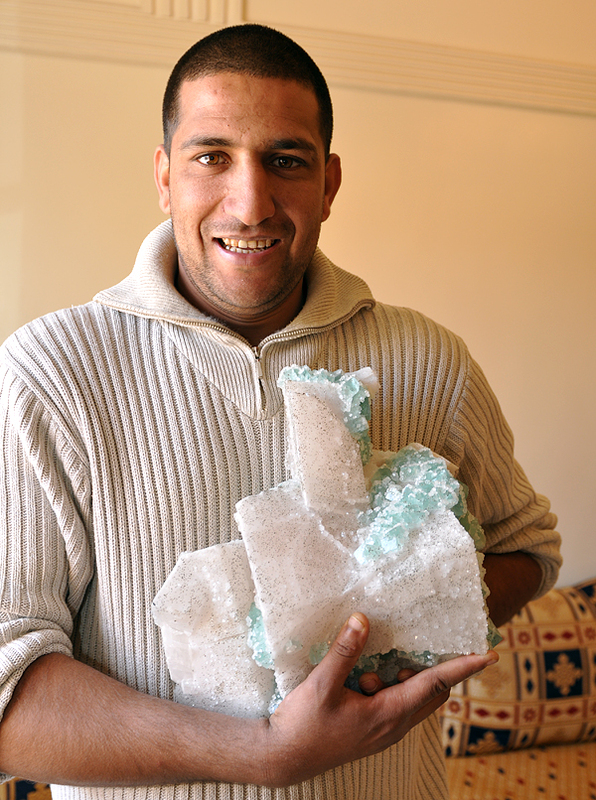 Muhammed with a huge specimen of calcite with fluorite from the new find in El Hammam. T. Praszkier photo. 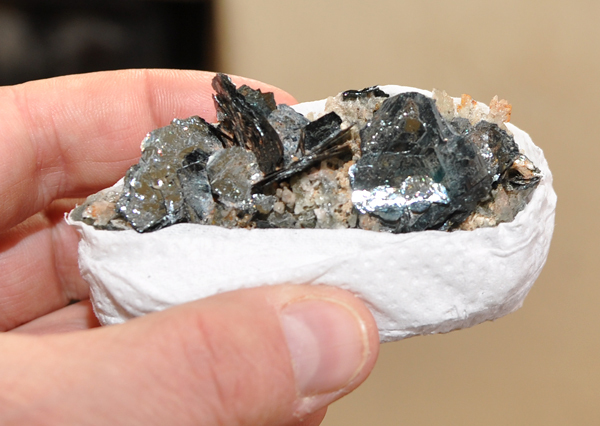 Native silver from Imiter we bought in Midelt T. Praszkier photo. 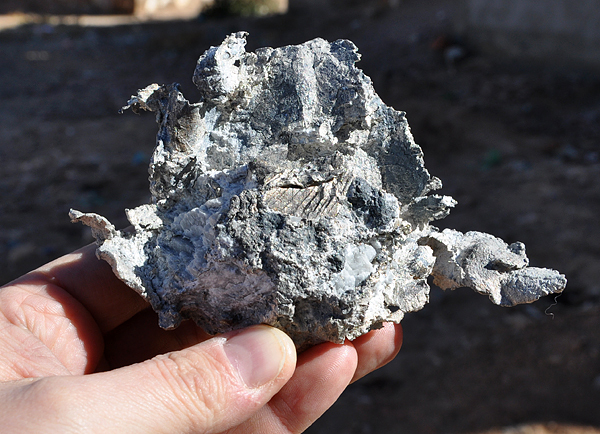 Native silver from Imiter. T. Praszkier photo. 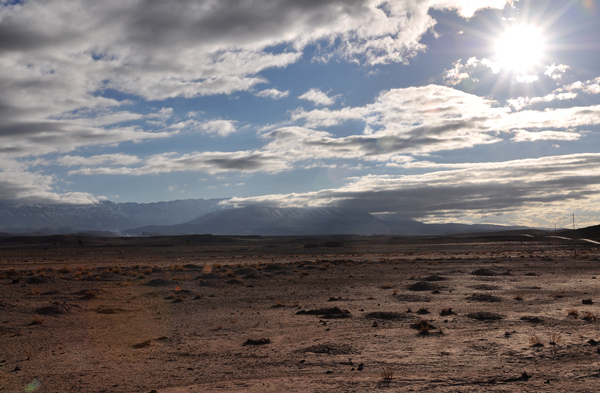 On the way from Midelt. T. Praszkier photo. 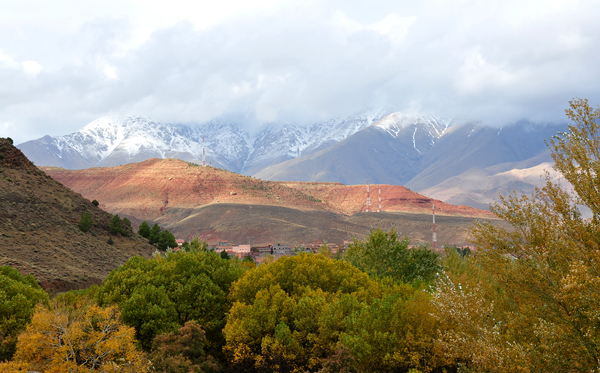 Clouds in High Atlas. T. Praszkier photo. 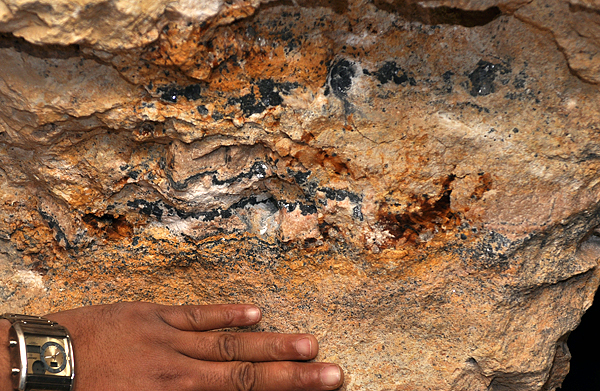 New hematites from the Imilchil area. T. Praszkier photo. 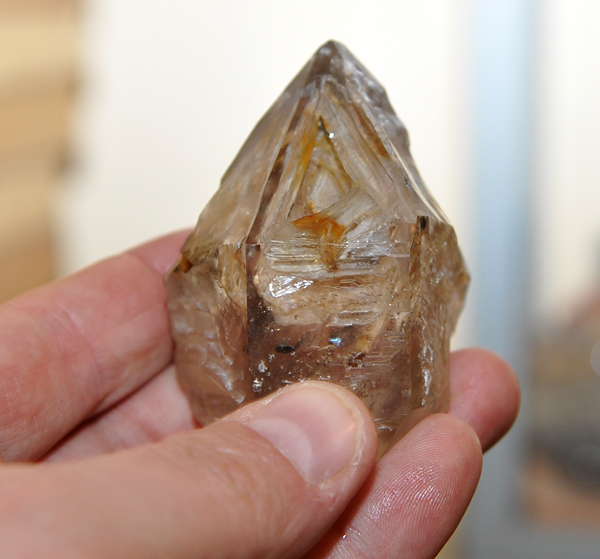 Skeletal quartz from the Imilchil area. T. Praszkier photo. 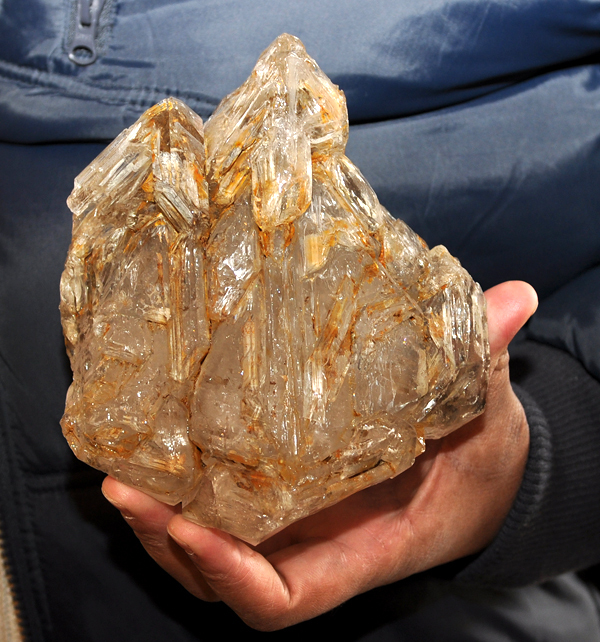 Huge skeletal quartz from the Imilchil area. T. Praszkier photo. 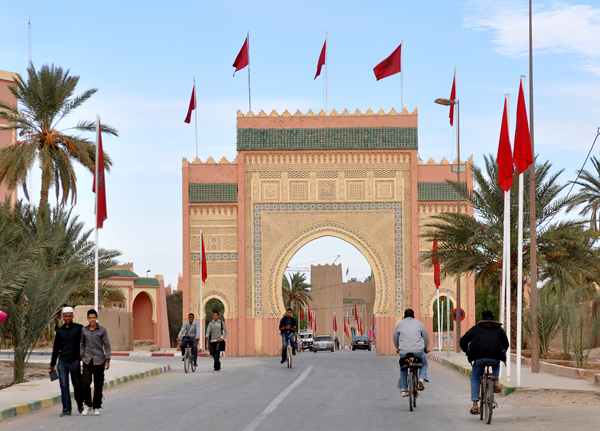 Traditional gate to Rissani town. T. Praszkier photo. 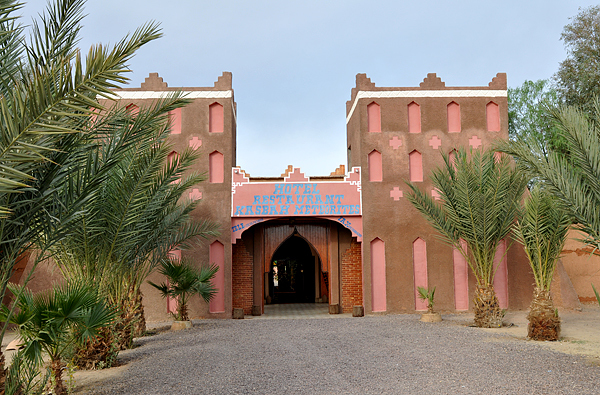 Kasbah Meteorite hotel - one of the hotels where the 2nd International Conference participants will stay in November 2012. T. Praszkier photo. 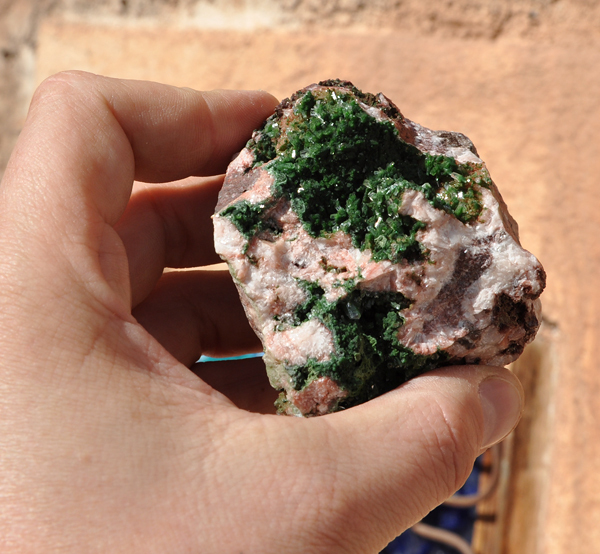 In Kasbah Meteorite hotel. T. Praszkier photo. 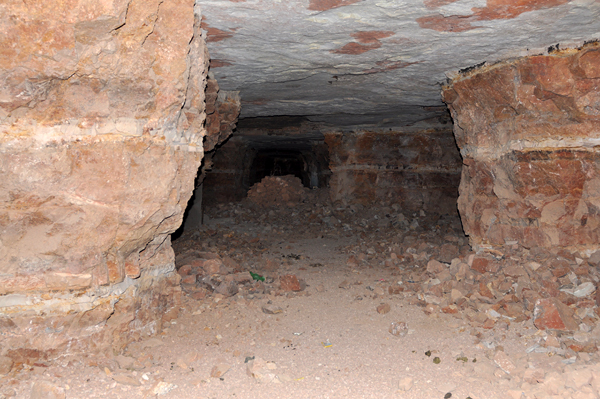 Bousiamas mine in Bou Azzer area. T. Praszkier photo. 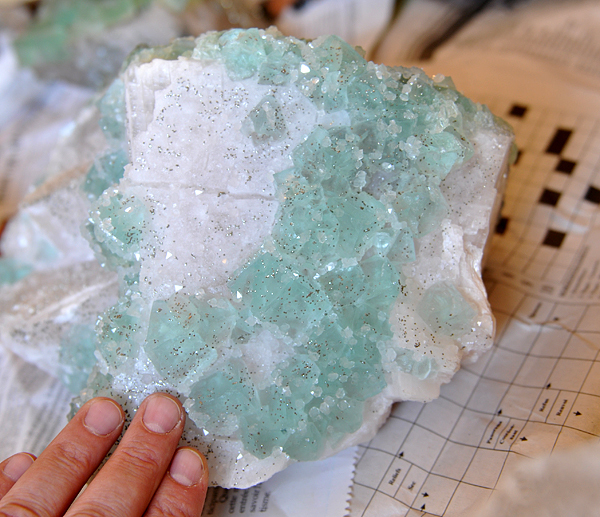 One of the last specimens of allargentum from Bouismas mine. T. Praszkier photo. 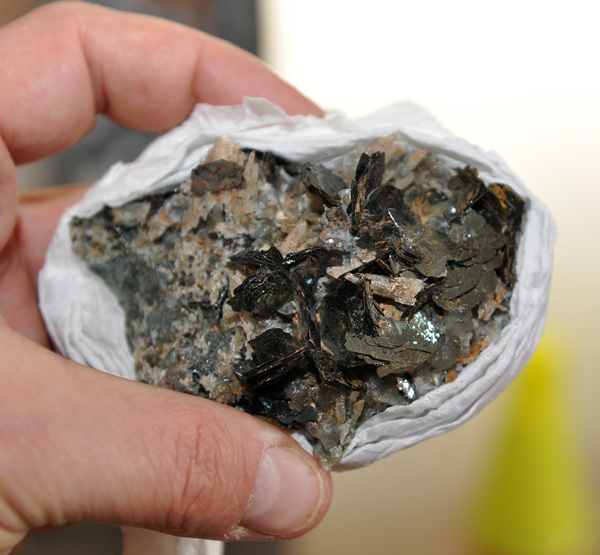 Proustite from Bouismas mine. T. Praszkier photo. 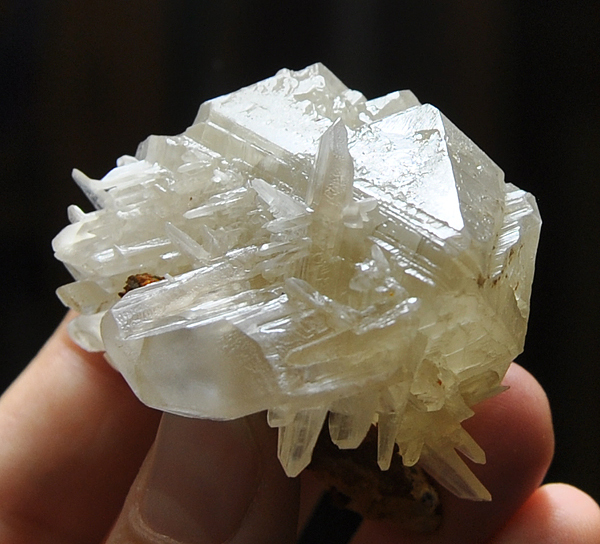 Superb (as for Bou Azzer) specimen of baryte, Bouismas mine. T. Praszkier photo. 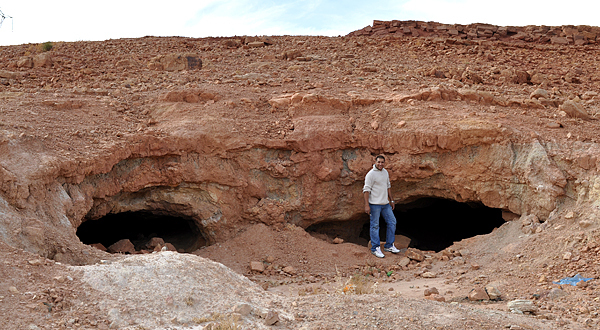 Aghbar mine - source of many superb specimens. T. Praszkier photo. 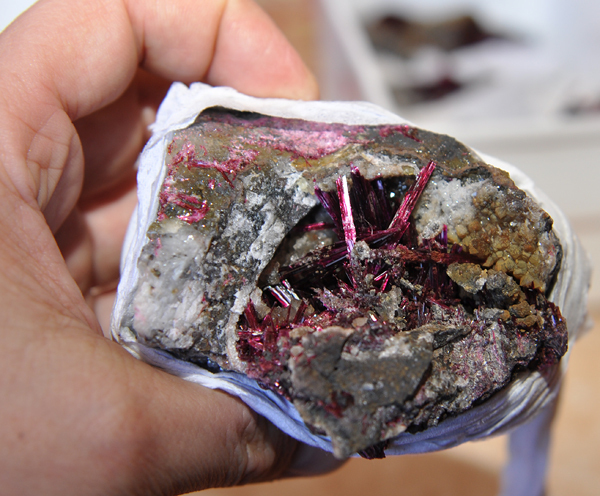 Wires of native silver with ?acanthite from Aghbar mine. T. Praszkier photo. 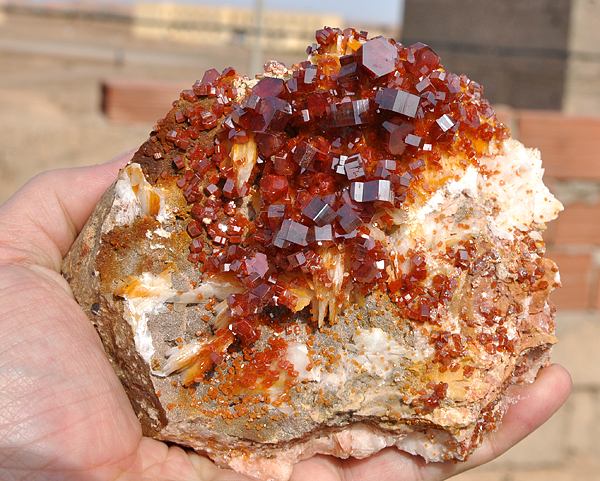 Conichalcites included in calcite from Aghbar mine. T. Praszkier photo. 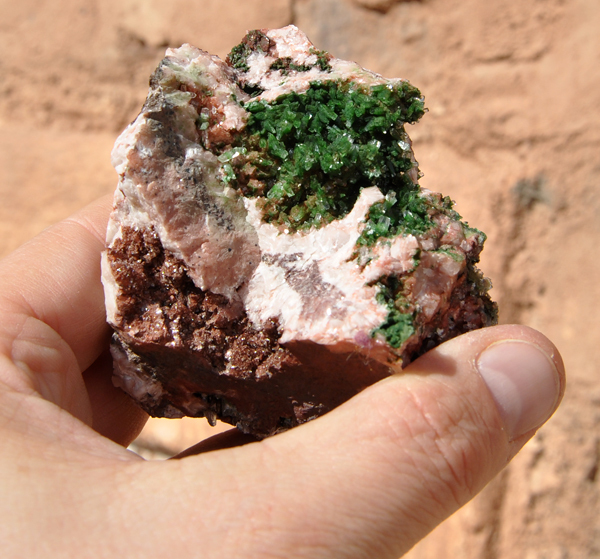 Cobaltocalcite from Agoudal mine. T. Praszkier photo. 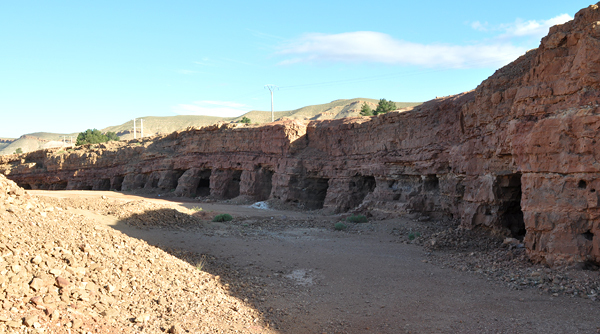 Agoudal quarry - source of ones of the world`s best erythrites. T. Praszkier photo. 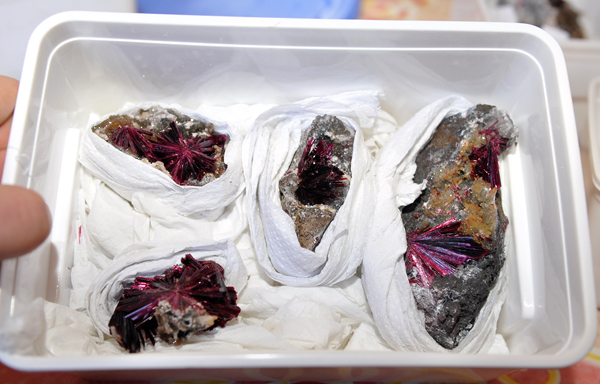 Specimens of erythrite from the Agoudal quarry. T. Praszkier photo. 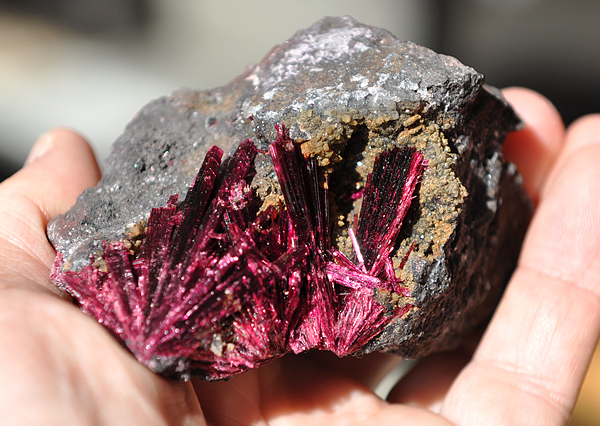 Specimen of erythrite from the Agoudal quarry. T. Praszkier photo. 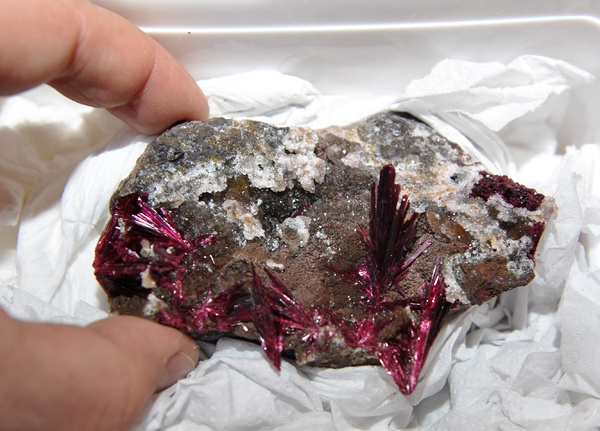 Superb specimen of erythrite on quartz from the Agoudal quarry. T. Praszkier photo. 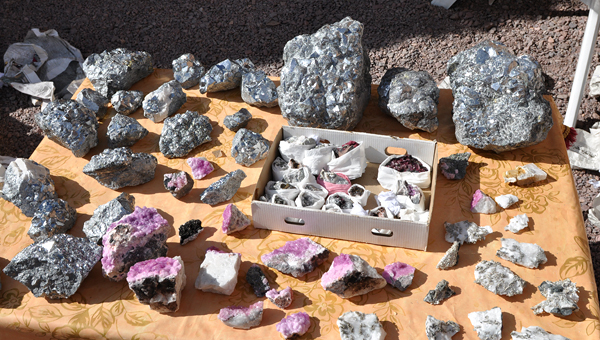 Skutterudites and cobaltocalcites from Bou Azzer area. T. Praszkier photo. 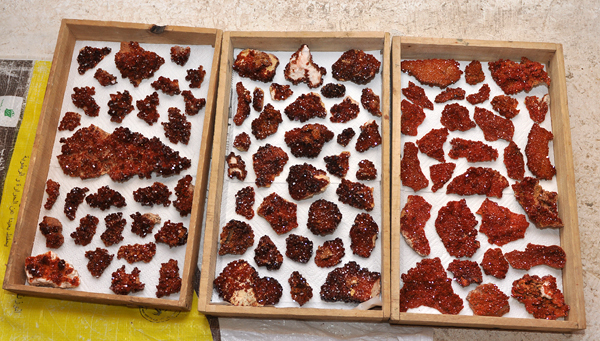 Cobaltocalcites and other specimens from Bou Azzer area. T. Praszkier photo. 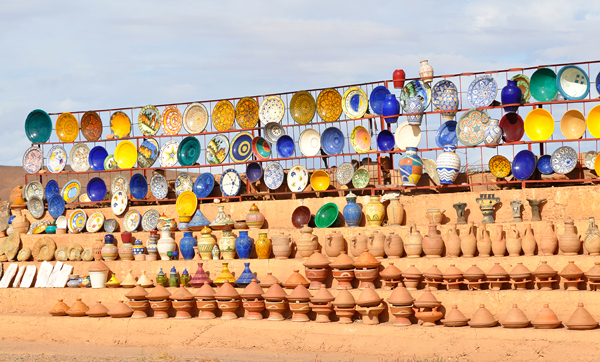 Traditional Moroccan pottery in one of the shops. T. Praszkier photo. 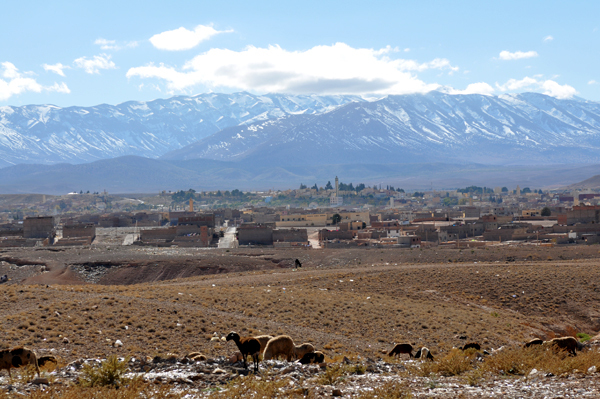 The last view to the High Atlas - good-bye Morocco - see you soon :). T.Praszkier photo. Tom, you did it again! 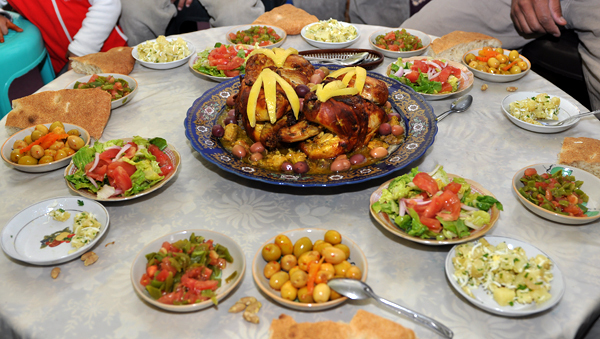 As always, very pleasent to read about your trips to Morocco. 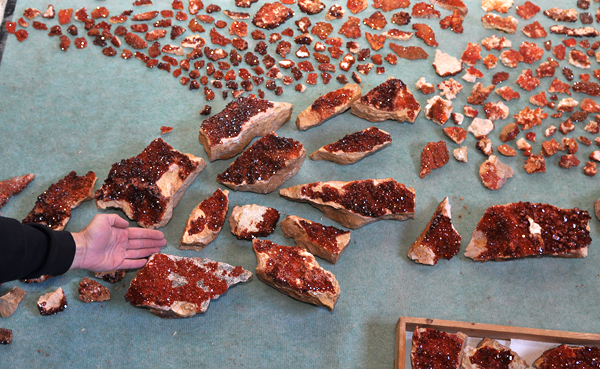 And a lot of very nice specimens! 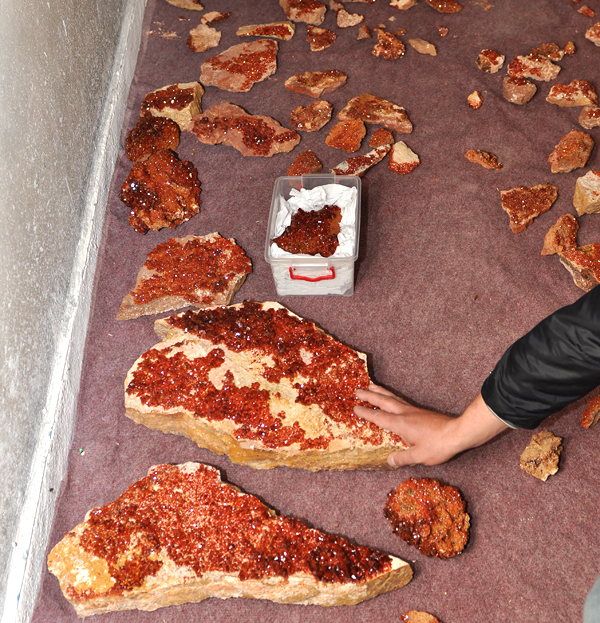 For me the sixling Cerussites, and the new Erythrites from Agoudal querry was the highlight. I really do looking forward to the next years Mindat tour! Thanks for making these reports from your trips!